Back by popular demand....Your Nashvile Bucket List - 2013. How many times have you found yourself saying this after a dining experience? Not spoken in anger, but simply stated as a matter of fact. It wasn’t terrible, but it was certainly uninspired and unmemorable. The bottom line, it could have and should have been better. We have often found ourselves saying this and we refer to it as “GNG”, good, not great. We have been fortunate to have had many times where we stop and say, “Wow, this is great!” These are the moments that all of us want to have. These are the moments that create long lasting memories. These are the kind of experiences that inspired us to start our blog and share our excitement with others. We are not alone, the world of Twitter and Facebook is full of people with this same desire. The desire to be inspired by something, somewhere or someone. So, what is it that makes something great? And why is it so hard to find? It is obviously far easier to be good than it is to be great. Certain things by their very nature are good. Pizza, hamburgers, Mexican food and bacon all taste good even if prepared by a rank amateur if one were hungry enough. So, opening an average pizza joint would be plenty adequate for a large number of people and would likely be financially successful if it were in the right location. To us, great financial success does not mean that something is great. It doesn’t even mean something is good. But should financial success be the goal? We do not feel that it should. We believe that great things are the fulfillment of passions and that the success comes as a result of inspiring others. 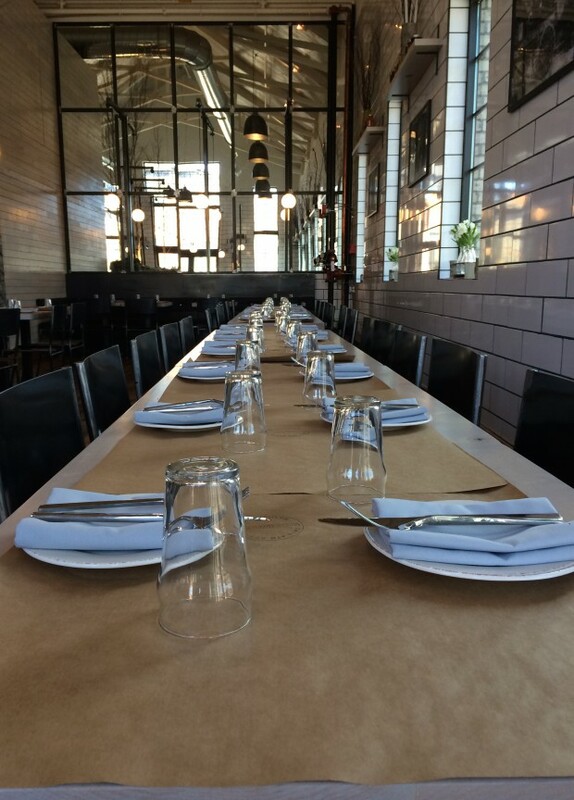 From our standpoint what makes a restaurant great? Quality – Great food is subjective to some degree, but we believe that it is a lot more objective than most people actually think. If presented with a truly great dish we believe that most people would be more in agreement than disagreement. Being great usually requires that someone has travelled and experienced the life, culture and food in other cities. How does your pizza really stack up to the best NYC pizza? How does your sushi compare with Uchi? So you make doughnuts, have you been to Voodoo? You would be surprised to know how many of your customers have and they can tell the difference. Service – Service is free. This is one of our biggest issues with many restaurants. Treating your customers with respect and kindness should be a given. Yet, it is so often lacking. Nothing will guarantee someone won’t return to your restaurant more than being treated rudely. The taste left in your mouth from bad service lasts far longer than that of poorly cooked food. Great service isn’t necessarily formal either. We’ve had some of our best service in casual restaurants. It is being attentive, knowledgeable and adaptable. If something unforeseen goes wrong, they can “make it right”. 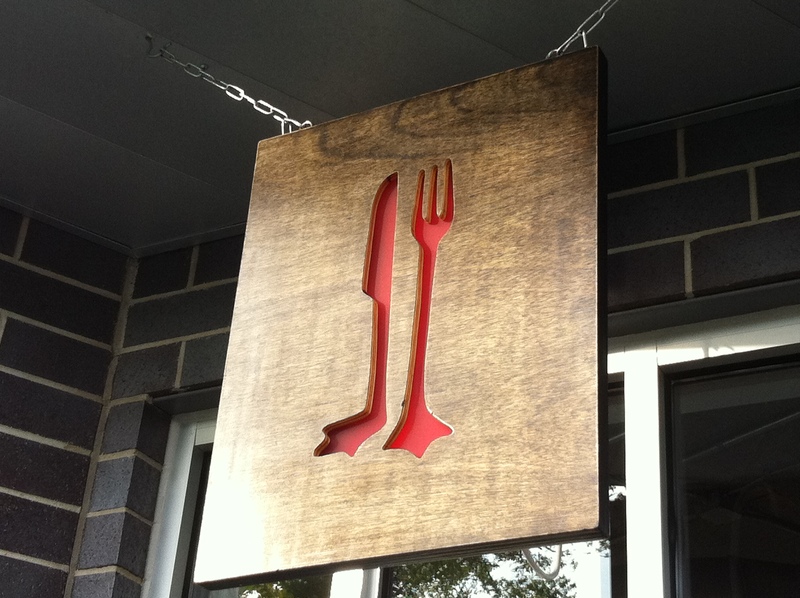 They know the menu inside and out, how the food is prepared, and can offer helpful suggestions. 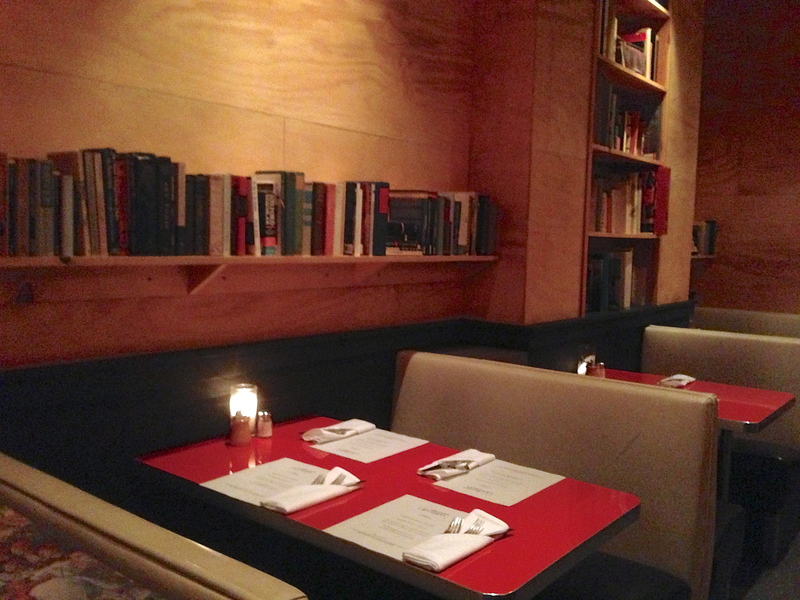 Atmosphere – Is the design of the restaurant thoughtful or an after thought? Is this a place that you want to return to? Consistency – If you love a dish you want it to taste the same when you have it again and again (and again). Originality – Being great is not often derivative. Simply copying what someone else is doing in another city does not make something great. Sure you may have the first Norwegian cuisine or Nose-to-Tail dining in your city, but that alone doesn’t make it great. It doesn’t even make it unique. It just makes it unusual for your city. Attention to Detail – There are many moving parts to any business, but is seems like the restaurant business has more than most of the others. Managing all of these moving parts and being aware of them makes all the difference. Passion – Being great has to be an intentional goal. The passion is the critical component, the financial success may be the outcome of the greatness but it cannot be the reason for being. Being great can also change neighborhoods and cities. From Paul Kahan and Rick Bayless in Chicago to Tom Douglas in Seattle to Barbara Lynch in Boston to Tyson Cole in Austin, these people have brought many truly great unique establishments to their cities and have changed the culinary landscape in each. So, strive for greatness, take the time to hone your skills and do the hard work that it takes day in and day out. It won’t be easy, but it will be worth it. 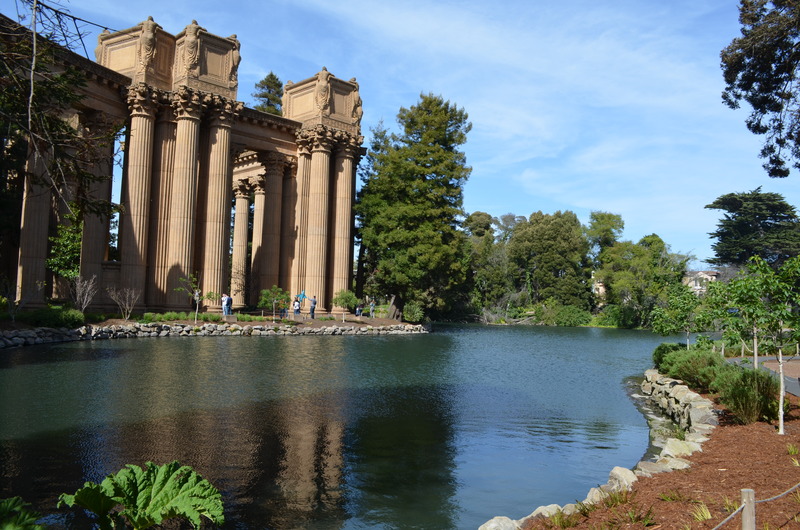 We were unable to make it to San Francisco last year due to the impending birth of our son (see our post from last March – Coulda, Shoulda, Woulda), but this spring we were determined to return to possibly our favorite city (with son and mother-in-law in tow). 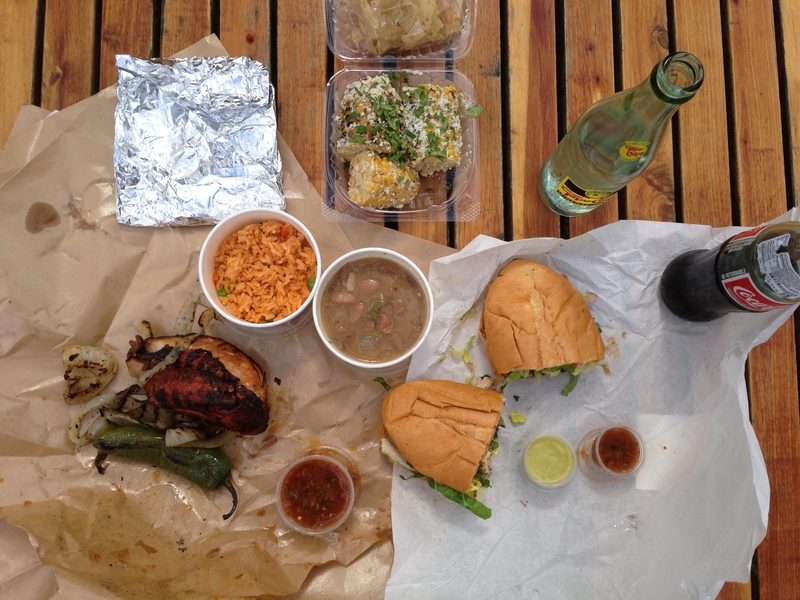 We were blessed with beautiful weather the entire trip and we had a lot of great eats as well (with one notable exception, see State Bird Provisions below). 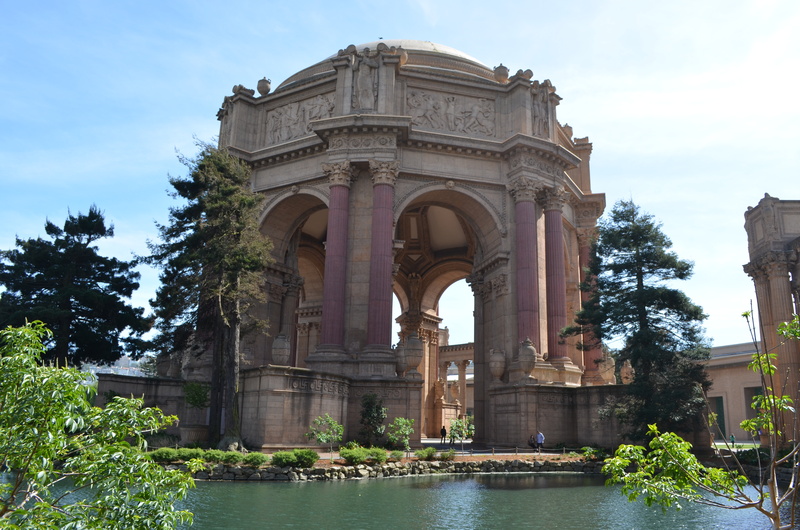 Here is a run down of all of the stops we made in the city by the bay. Those marked with an asterisk (*) indicate those establishments that are also on our San Francisco City Page. 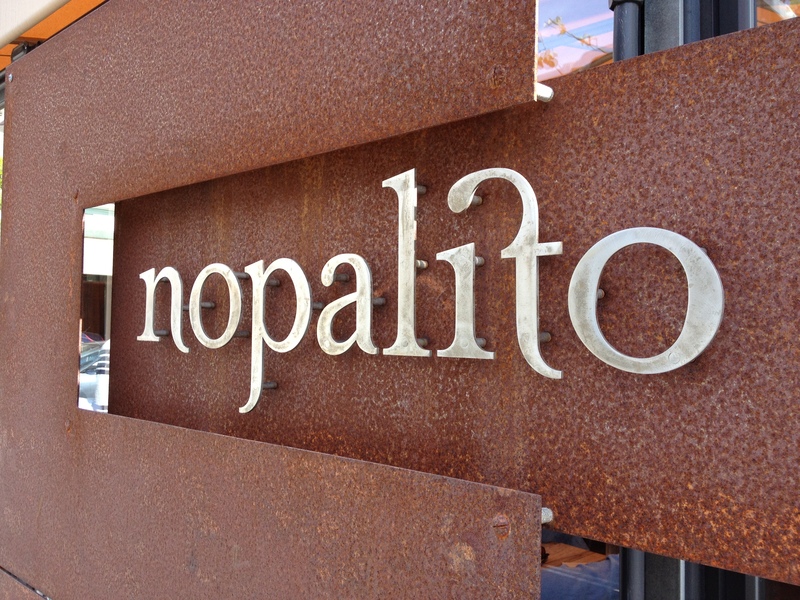 * Nopalito – Our best overall meal in San Francisco. We previously loved this Mexican taqueria near the Haight-Ashbury neighborhood but we were even more impressed with it this trip. The Totopos con Chile were some of the best tortilla chips that we have had – tortilla chips with just the right thickness and a salsa de arbol that left a nice slow spicy burn. 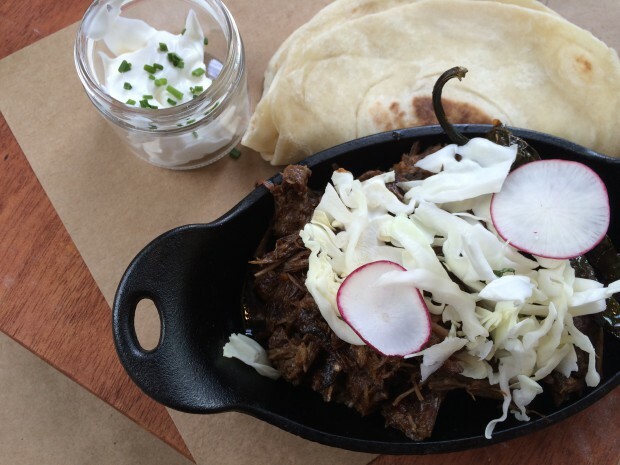 The carnitas were the best that we have ever had – the pork tender and moist from its bay leaf, cinnamon, milk and beer braising with perfect hand made yellow corn tortillas. 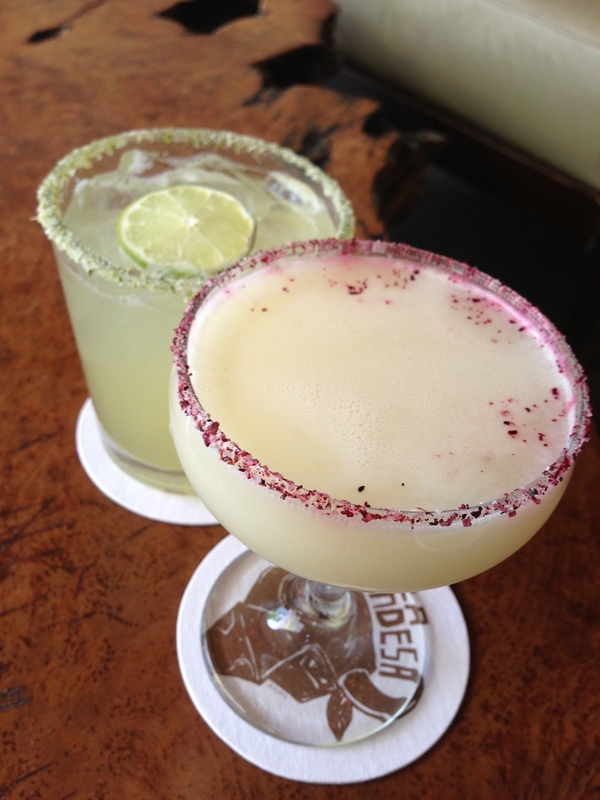 Their cocktails have likely inspired a summer obsession for us – drinks with mezcal. We loved the smokiness that the mezcal tequila brought their drinks, particularly in the Killer Bee (with lemon and honey). 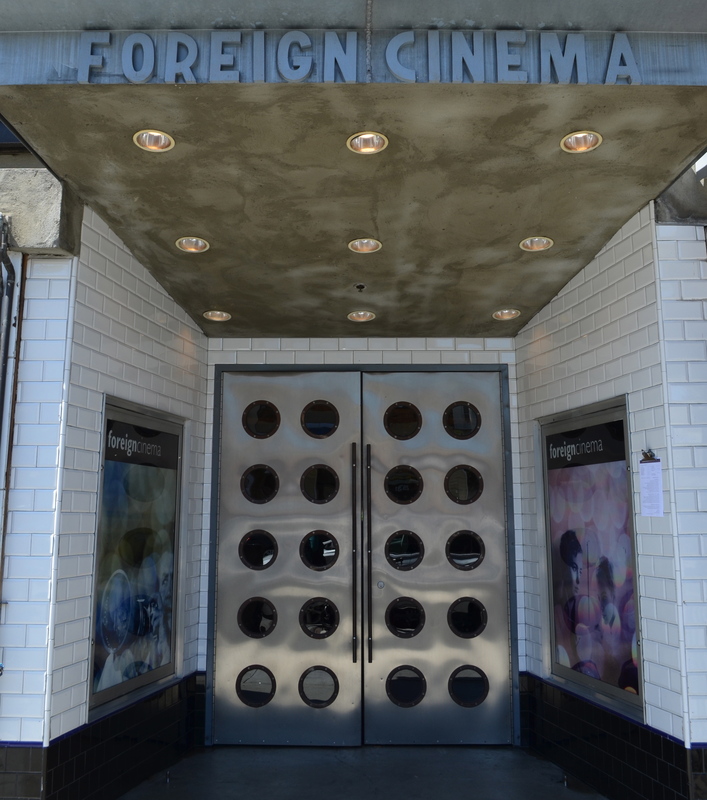 * Foreign Cinema – it is a rare occasion when you walk through the doors of a restaurant and immediately know you are going to have a memorable meal. 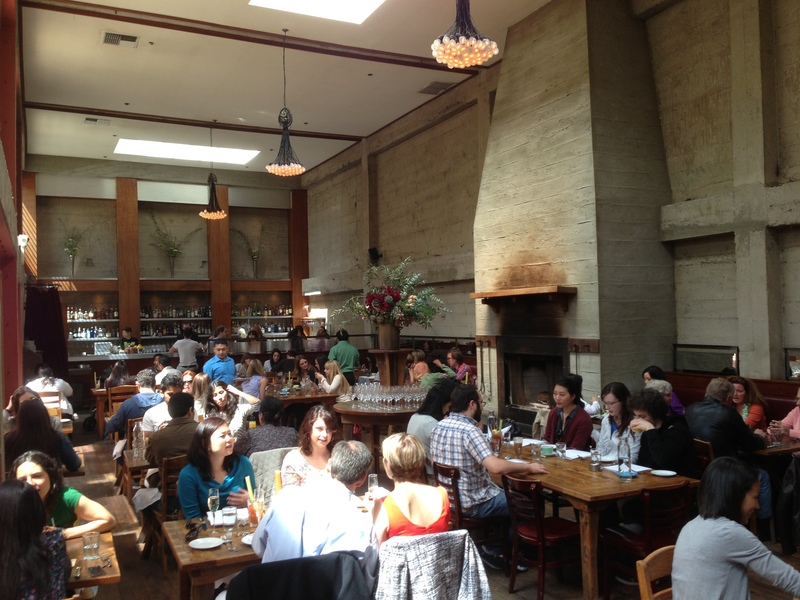 Our brunch at Foreign Cinema was one of those rare occasions. In what appears to be a movie theater on the verge of bankruptcy on the outside, once we walked down the dark hallway to the restaurant you are transported to one of the most beautiful restaurants we’ve seen. 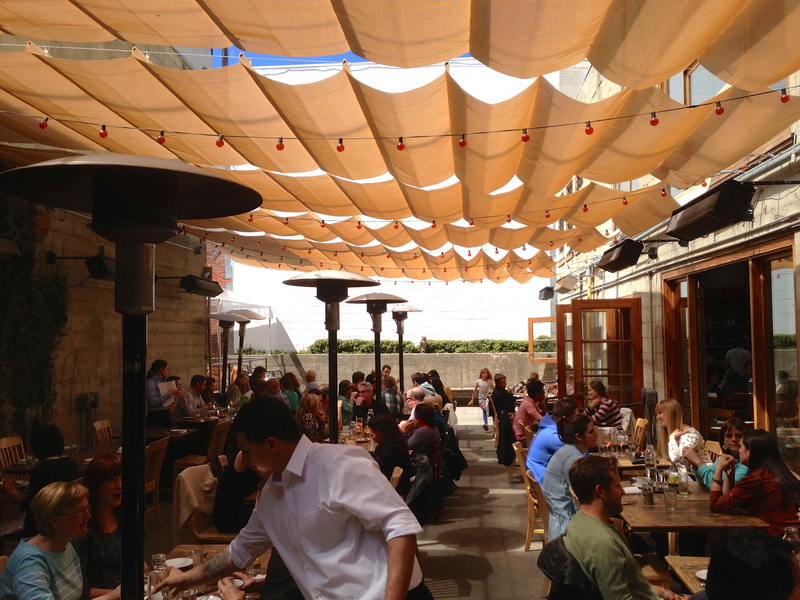 On the left is an open outdoor patio where movies are projected at night for dinner service. On the right side is a beautiful high ceiling dining room with rich wood tables and chairs and exposed concrete walls. The meal lived up to the decor – pristine Kumamoto Oysters, fantastic cocktails, wonderful Croque Madame and some of the best bacon we’ve eaten anywhere – slow cooked brown sugar bacon that melts in your mouth. 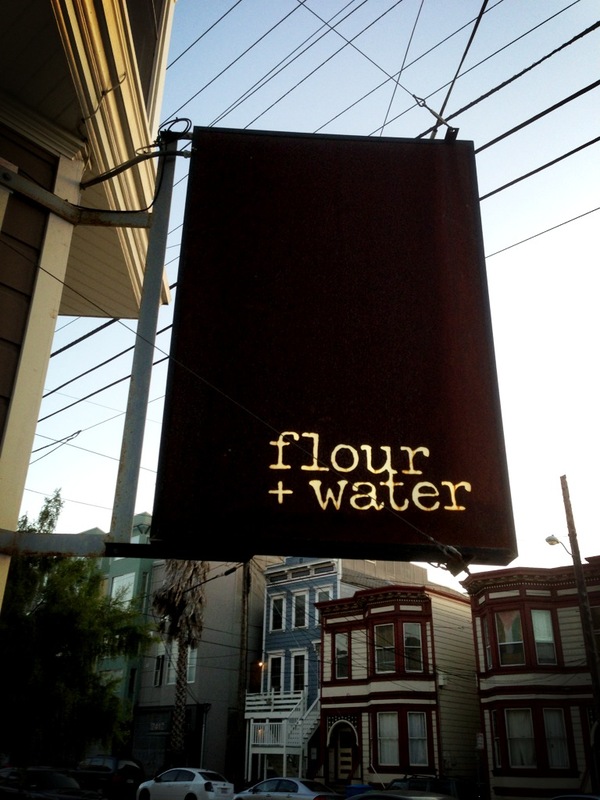 Easily on our short list for Best Atmosphere and Best Brunch for 2013..
* Flour + Water – Handmade pastas and pizzas from a James Beard Rising Start Chef of the Year Nominee Chef Thomas McNaughton in the Mission District. A visit here was high on our priority list and the food met our high expectations. The Duck Tortelli with king trumpet mushrooms and green garlic was one of the best pasta dishes that we’ve had – this stuffed pasta dish with tender duck confit left us contemplating how much of a faux-paux it would be to lick the plate in the middle of the restaurant. The squid ink spaghetti and the calamari pizza were also stellar dishes. The only flaw seemed to be the noticeable length of time between dishes. 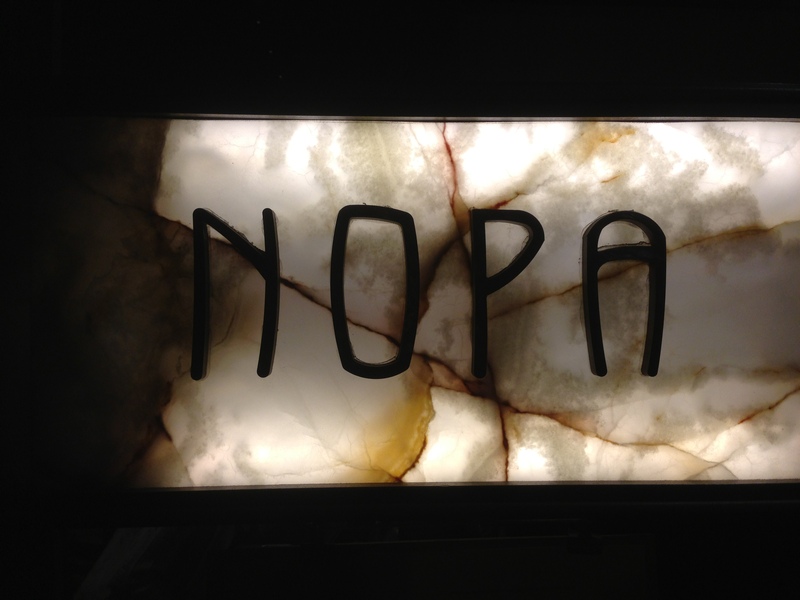 * Nopa – one of the most popular restaurants among locals for good reason. 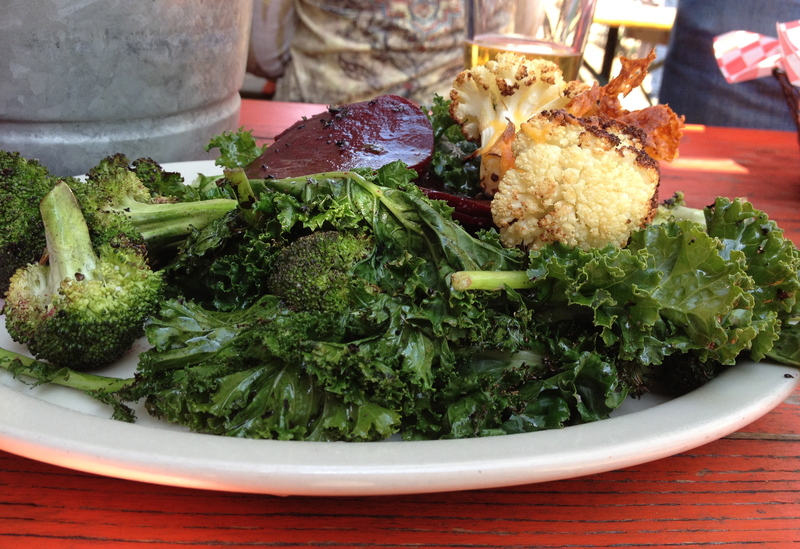 This big sister restaurant to Nopalito features organic and seasonal ingredients prepared in a wood-fired oven. The vibe is fun, energetic but not hectic or pretentious. 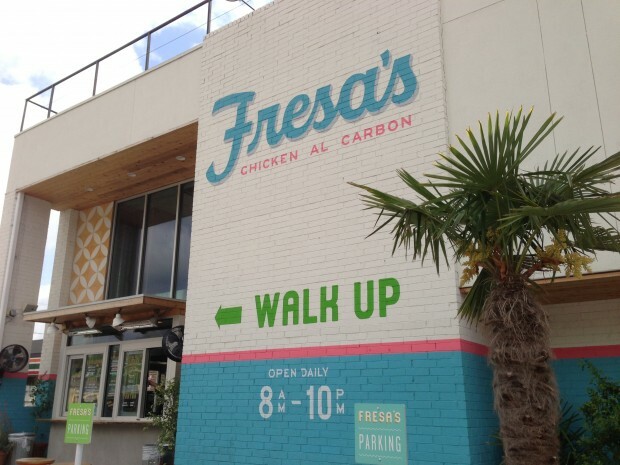 One of the first restaurants to be famous for both their upscale hamburger and their rotisserie chicken – we tried and enjoyed them both. 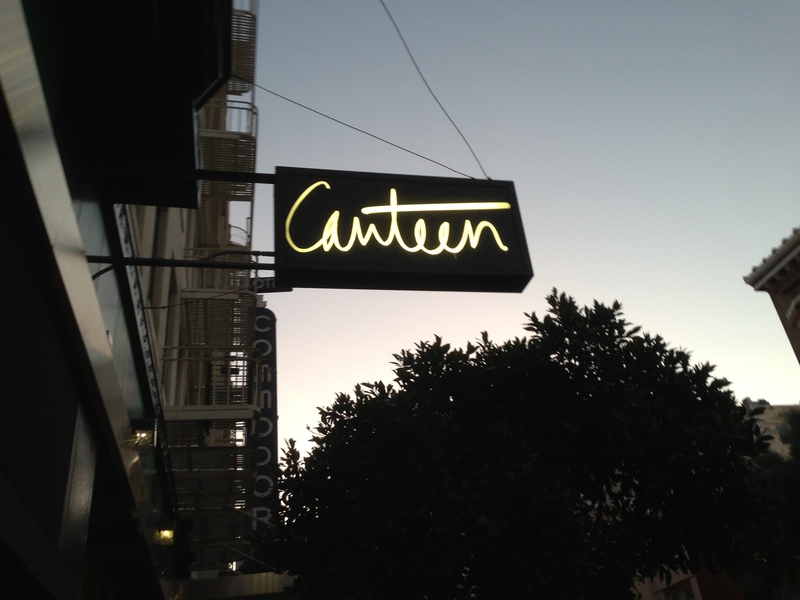 * Canteen – tiny but charming restaurant from Chef/Owner Dennis Leary (The Sentinel). There are 4 courses (5 if you count the addictive buttery brioche buns with sea salt) for a very reasonable $50. The menu is sort of a prix fixe menu – the salad and soup are set items, but there are two options for the entree and dessert. He is running a “100 Menus Project” currently, where he features a menu based on the 1971 cook book, “The Hundred Glories of French Cuisine”. Standouts were the brioche buns, the smoked trout salad with endives and mustard as well as the Spring lamb with baby onions and asparagus jus. If we lived in San Francisco this would be a place we would come to often. 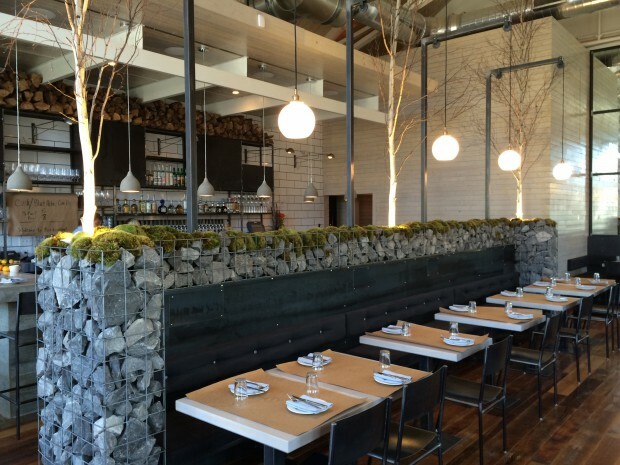 State Bird Provisions – It is hard to explain how disappointed we were with our food and experience here. 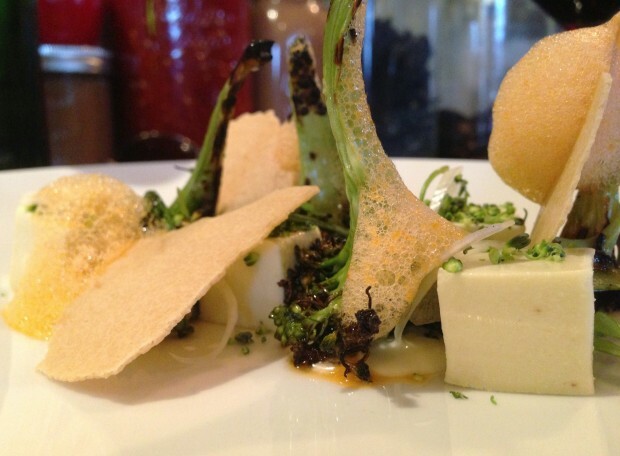 This restaurant has not only been touted by Bon Appetit as their #1 Best new restaurant in 2012 but also a finalist for the James Beard Best New Restaurant in America this year. After eating here we were left thinking, does the Emperor have no clothes? 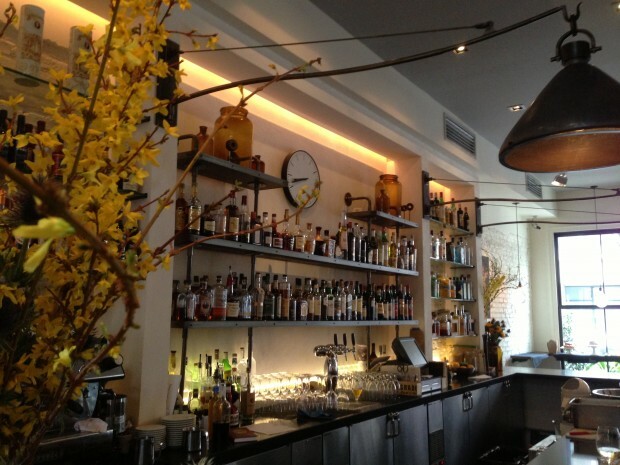 The concept is great, creative small plates served dim sum style. The execution and the food, however, were what we would describe as “not-good” to “average” at best. Hot dishes that should have been served hot came around the room semi-cold and oysters were served near-room temperature. The decor was reminiscent of a kindergarten play room. We were so looking forward to this meal and regretted starting out our San Francisco culinary excursion in this way. (Note, in general we do not give bad reviews on this site, so this obviously struck a chord in us to write this). 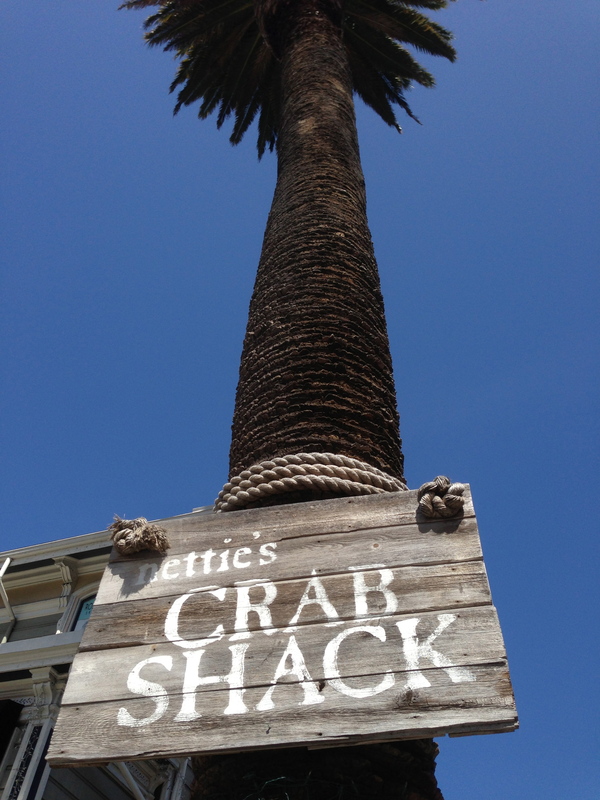 * Nettie’s Crab Shack – We have yet to have anything that wasn’t delicious at Nettie’s Crab Shack. On a beautiful day, sitting on the porch in this Cow Hollow gem having an Anchor Steam on tap and a Dungeness Crab Roll is about as good as it gets in our book. The Fish and Chips were also fantastic and we were blown away again by their desserts. (On a side note – restaurants pay attention to what Nettie’s does with it’s desserts – it is not about how “fancy” or “creative” your desserts can be, it is about leaving a lasting memory of some delicious treat in the customers’ minds. Keep it simple and keep it tasty). We inhaled the Strawberry Rhubarb Crisp with Vanilla Ice Cream and the Dirty Blondie with Caramel and Chocolate Chips. 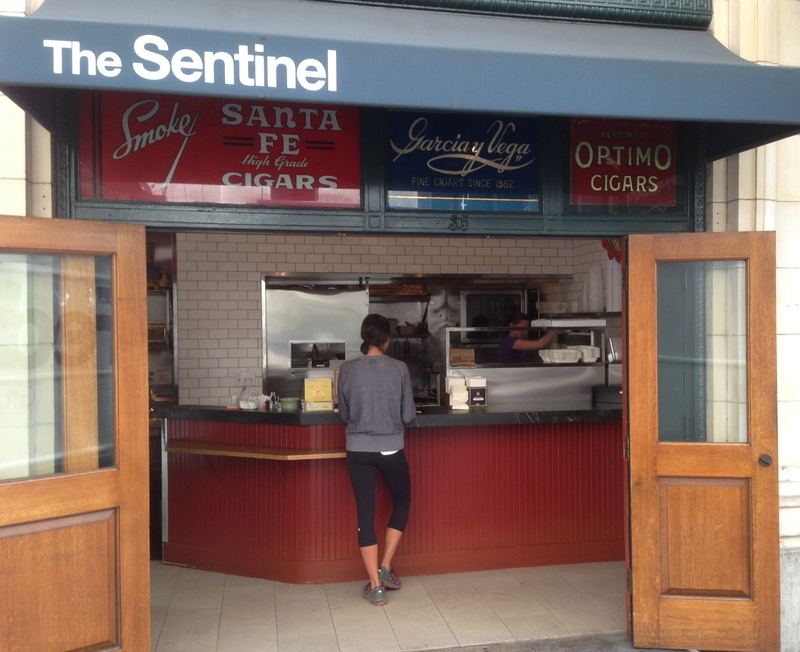 * The Sentinel – Although we STILL have not had a sandwich from this FiDi artisanal sandwich shop from Chef Dennis Leary, we did stop in for some very tasty pastries and oatmeal. Next time!! 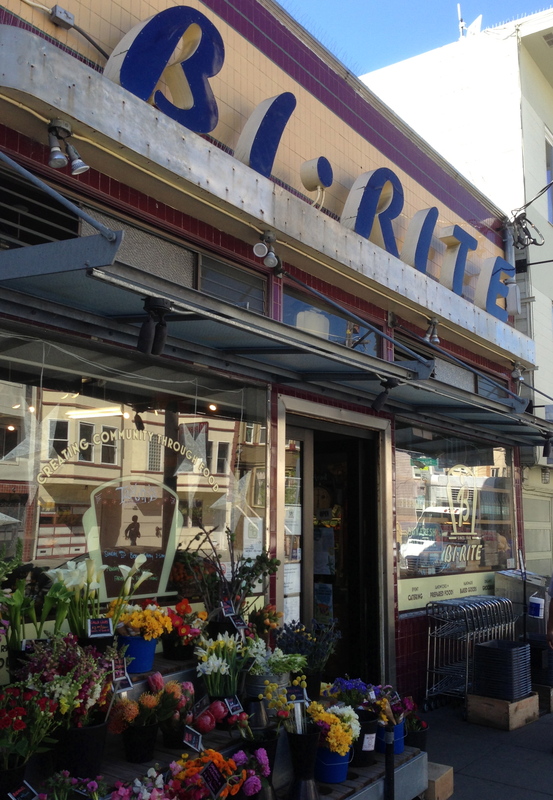 * Bi-Rite Market – if you want to know what a neighborhood grocery store should look like, visit the Bi-Rite Market. This legendary market has been open since 1940 and is as popular and relevant as ever. 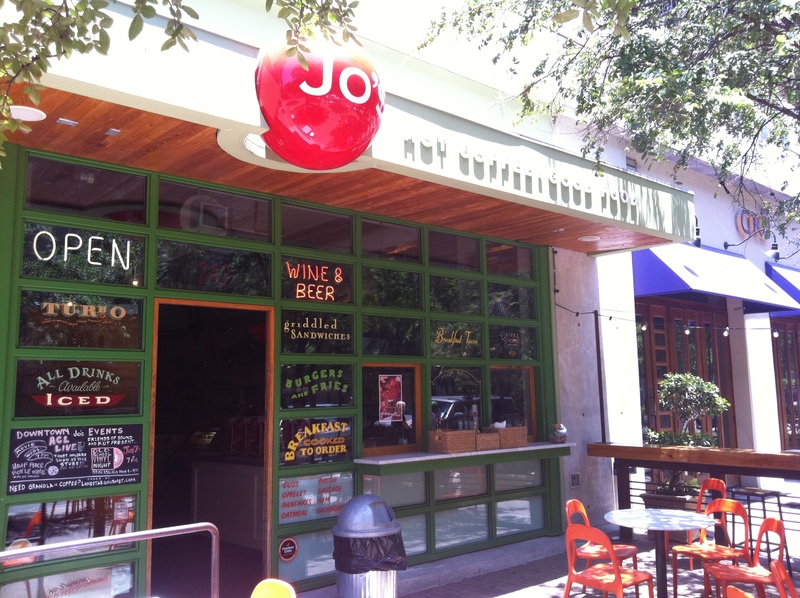 * Ales Unlimited – Specialty beer store tucked away on a quiet corner in Pacific Heights. Surprisingly excellent selection of microbrews and Belgian beers. We picked up a bottle of The Bruery’s “Sour in the Rye” – a great barrel aged sour ale from one of our favorite breweries that we can’t seem to get our hands on in Tennessee yet. 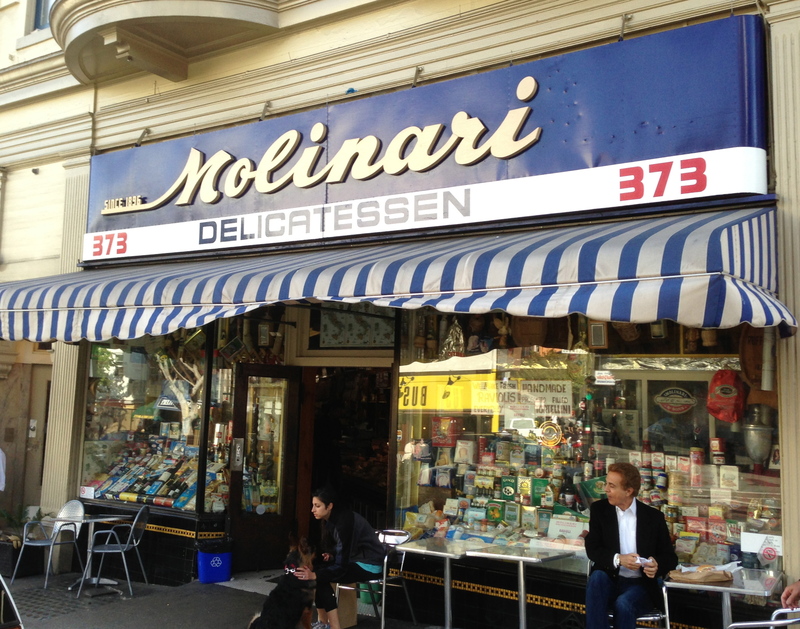 * Molinari Delicatessen – classic old-school Italian sandwich shop in North Beach. Get a number, then pick out your bread from the bin and get in line. 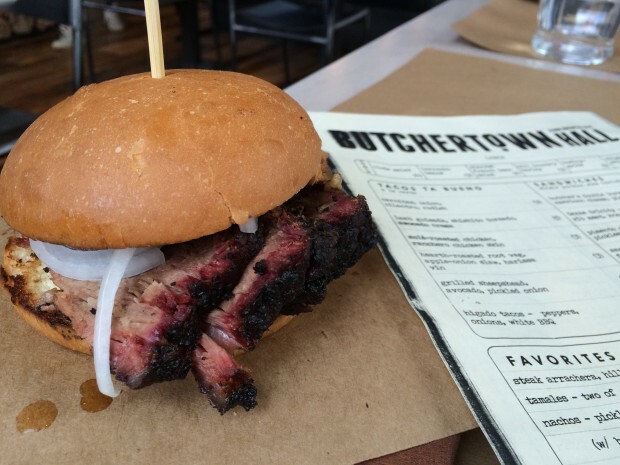 The tough part is deciding which meat to get on you sandwich – they all sound great. They also have a nice supply of cheese, wine and olive oils. In my mind, I picture this place looking identical to this 60 years ago. 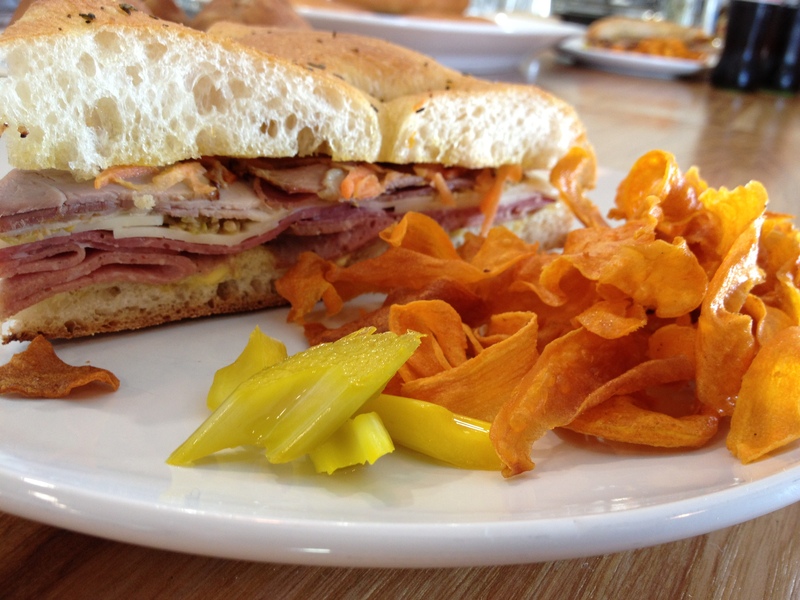 Il Cane Rosso – salads and sandwiches all with local ingredients and an Italian leaning. 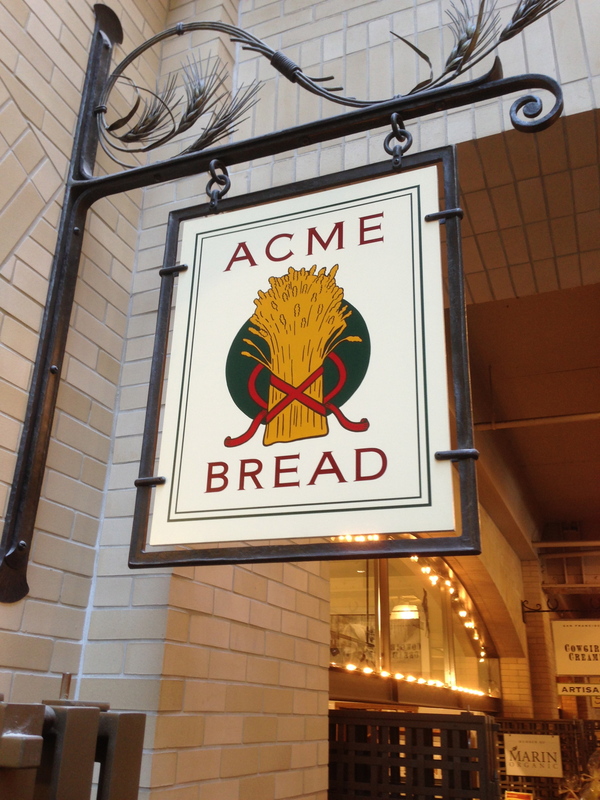 We tried several things and enjoyed them but the best thing we ate was their Acme bread and butter. 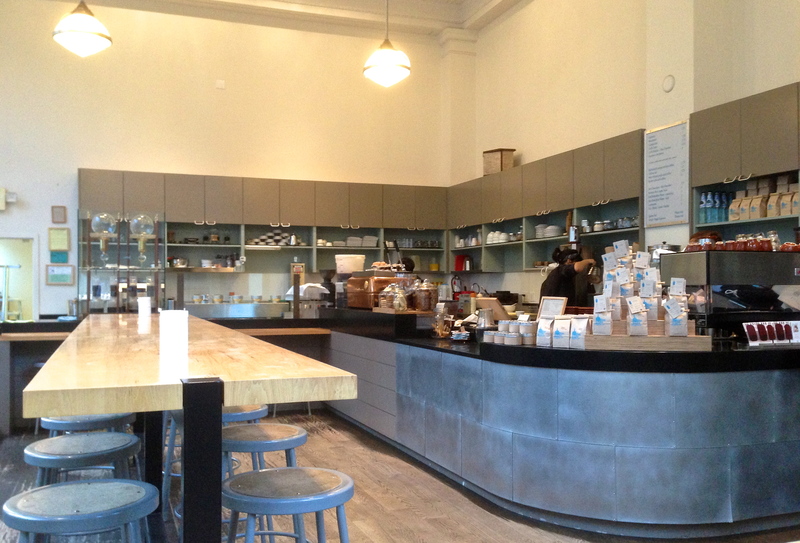 * Blue Bottle Coffee @ Ferry Building – more of a coffee/espresso and pastry shop than the Blue Bottle in Mint Plaza, but still a must nevertheless. A few menu items are featured, however, including their liege waffle and sandwiches on an Acme Baguette. 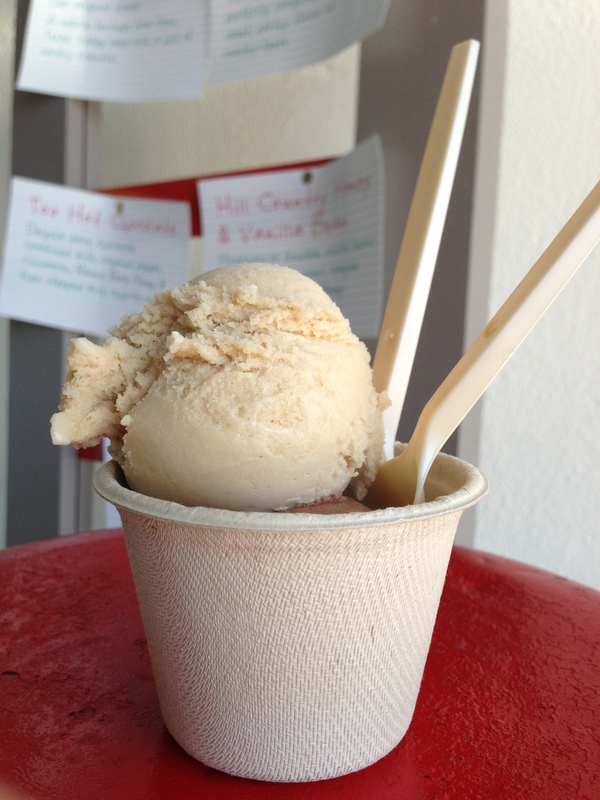 Try the excellent Affogato with Humphry Slocombe Brown Butter ice cream if you are craving a sweet pick me up. * The Acme Bread Company – when you get truly great bread there is something magical about it. 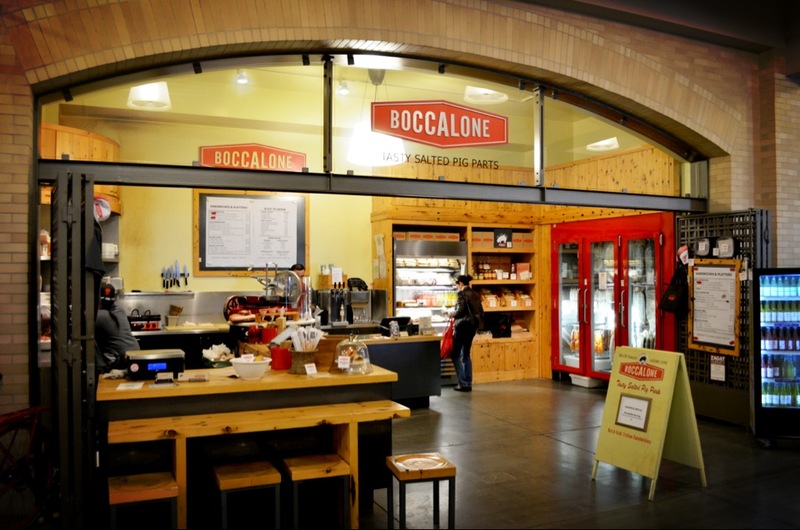 Trust us, go to Boccalone and order a Salumi Cone ($3.75), then walk over to Acme and get a Rustic Roll ($0.80) – it will be the tastiest $5 you have had all year. * Boccalone – this salumeria from Celebrity-Chef Chris Consentino’s with “Tasty Salted Pig Parts” turns out some of our favorite charcuterie. For further instructions, see Acme Bread Company above. * Out the Door – casual Vietnamese take out attached to and run by Slanted Door. We previously enjoyed the Banh mi and this time found the Lemongrass Pork Vermicelli Bowl and Curry equally tasty, but perhaps a tad bit pricey. * Biscuit Bender – why is it inordinately hard to find a great biscuit? What is the secret? Sunrise Biscuit Kitchen in Chapel Hill, NC cranks them out by the hundreds every day. We were starting to lose hope that we wouldn’t find another until we ate a Classic Buttermilk Biscuit with Cinnamon Butter from the Biscuit Bender. It had just the right amount of heft and flakiness and yet still moist and flavorful – just the kind of biscuit we had been craving. People’s Donuts – these vegan donuts tasted, well…vegan-y. Apparently butter, eggs and milk are key ingredients for a good donut. 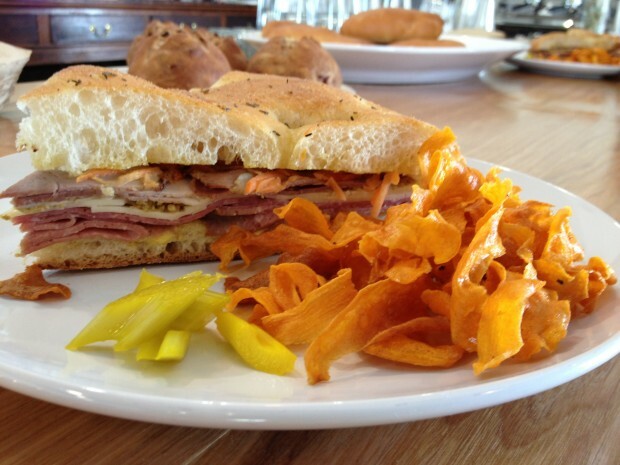 Roli Roti – maybe we are more in love with the thought of a Porchetta Sandwich than the actual sandwich itself. 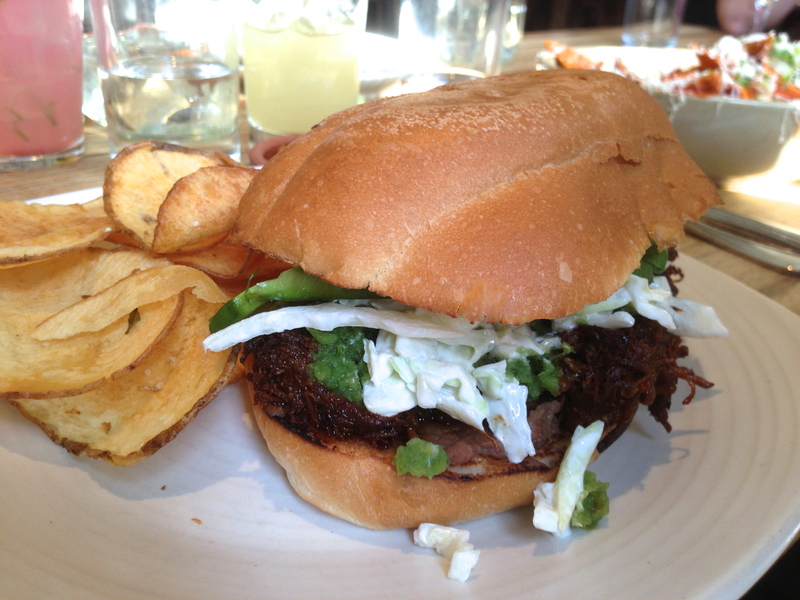 I mean, it sounds perfect – moist tender slow-roasted pork sliced on a roll. What could be wrong with that? 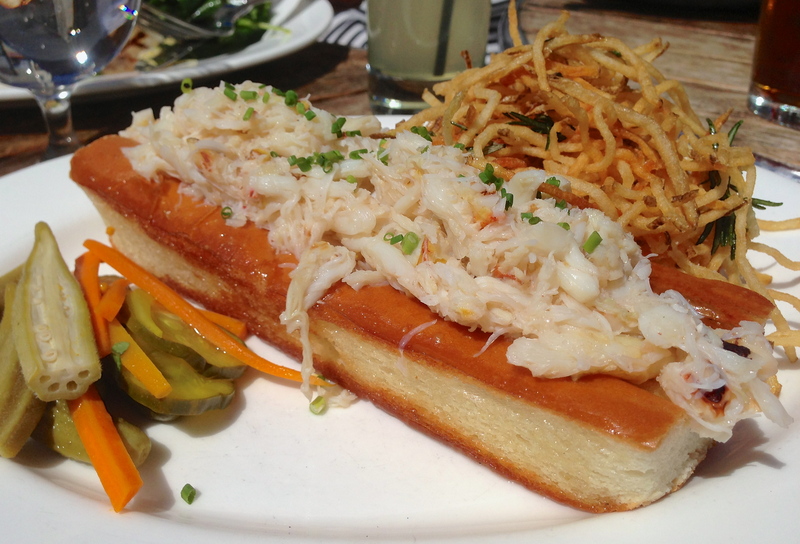 Don’t get us wrong – this is a very good sandwich and I am sure in many people’s books a great sandwich. For us, I think it is just a little too much pork fat. Next time we will try the Range Chicken – it looked great. Mijita – we can be pretty tough critics when it comes to chips and salsa at Mexican restaurants but we enjoyed them at this cantina from renown chef Traci Des Jardines. The carne asada taco and margarita were both good as well (not so much for the unmemorable fish taco). Namu Gaji Street Food – although we were sad that we could not make it to this Mission hot spot Namu Gaji for their upscale Korean food – we were happy that we got to taste their food at the Farmer’s Market. The bulgogi “tacos” (with seaweed playing the roll of the tortilla) were just how we like bulgogi – salty and juicy. A side note – bulgogi is the next banh mi. 4505 Meats – it is never a good thing when your chiccarones taste like cotton candy and leave a strange film in your mouth. 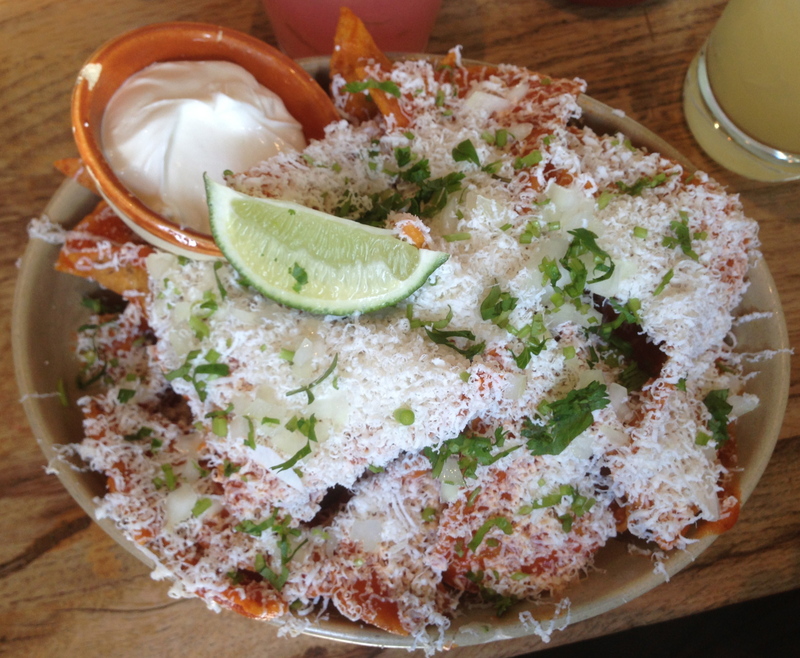 And trust us, we were with some expert chiccarones eaters. 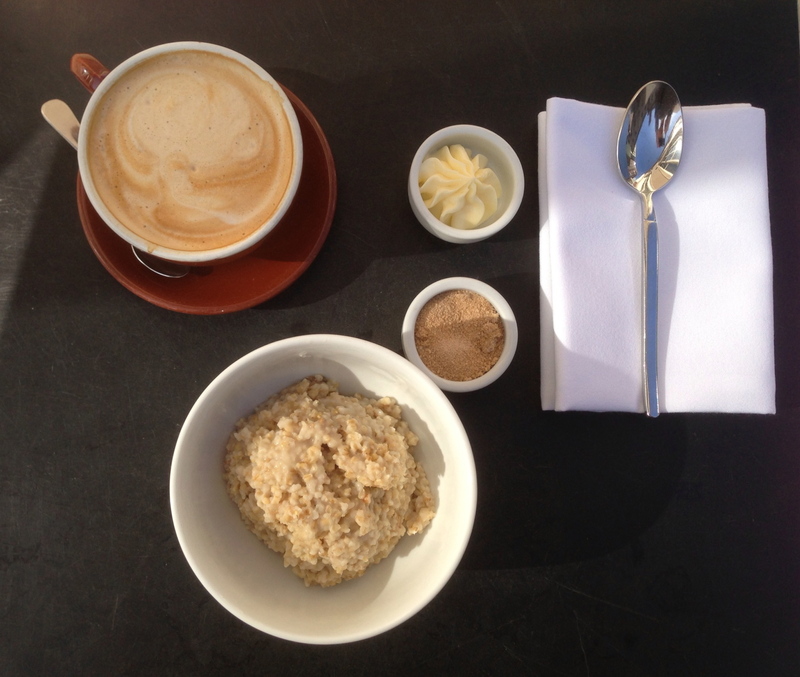 * Blue Bottle Coffee @ Mint Plaza – when we tell people that this Blue Bottle Cafe has “The World’s Best Toast and Jam” and “The World’s Best Oatmeal” we often get puzzled looks. Looks that suggest inside they are thinking, “Ok? Toast and Jam?! Oatmeal?! Whatever.” But until you have had this toast and jam and this oatmeal you should just trust us – they are unbelievable. 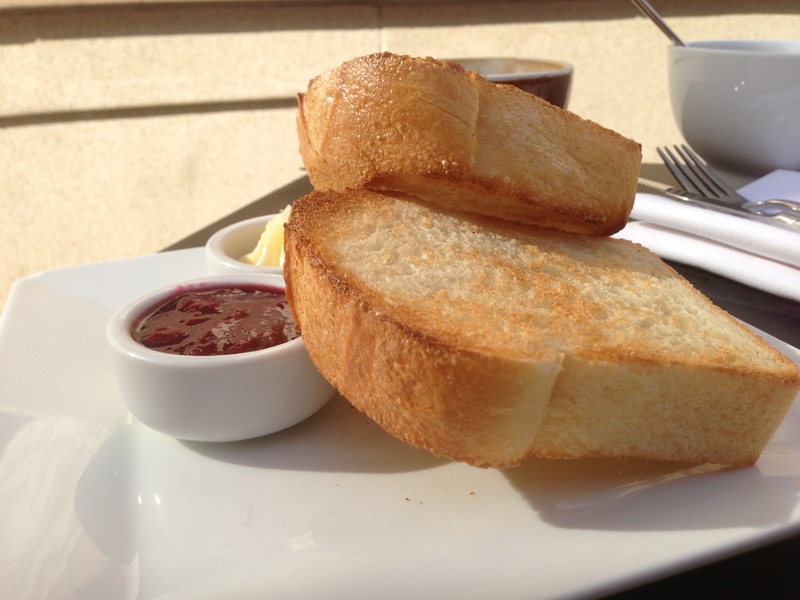 The thick cut Acme bread is perfectly toasted and the whipped butter and jam (raspberry) makes for the perfect bite. The Steel-Cut Oats with brown sugar and whipped butter were every bit as good as we remembered. Out of all of the coffee we had all week (and it was a lot, our kid barely slept a wink) the best was the Burundi coffee made at the Siphon Bar. The siphon creates an even cleaner smoother version of a pour over without any paper filter taste. 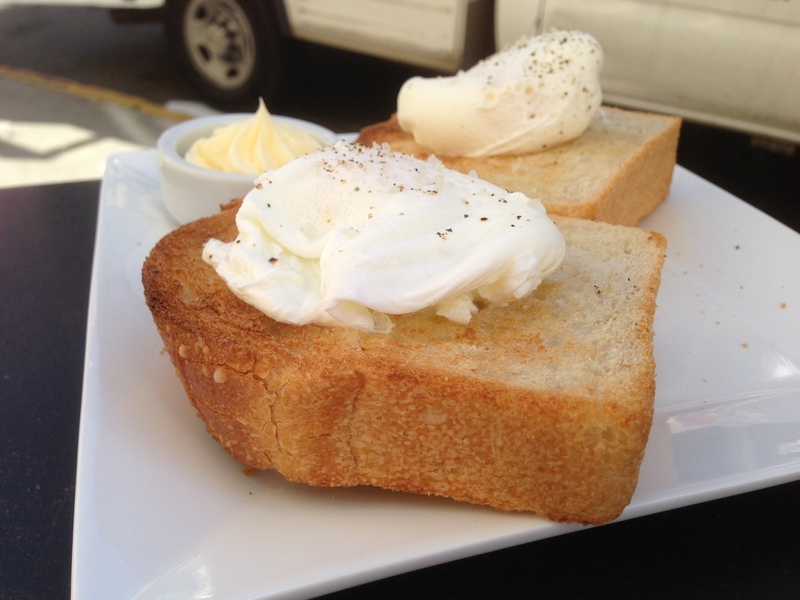 Not only that, we are also officially declaring their Poached Egg with Buttered Thick Cut Acme Toast as “The World’s Best Egg and Toast”. 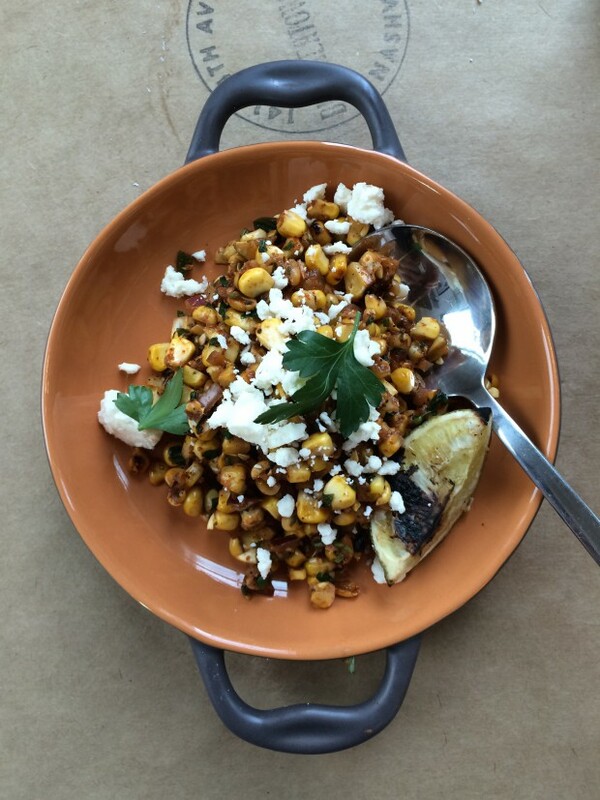 We could seriously eat Blue Bottle every morning for the rest of our lives. 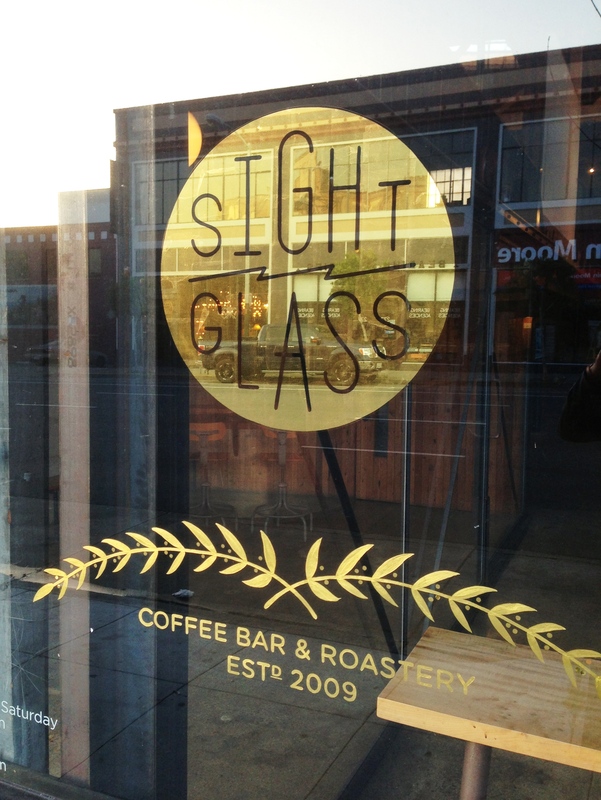 * Sightglass Coffee – we’ve been to hundreds of coffee shops all over the country but none of them are as good looking as Sight Glass in SOMA. 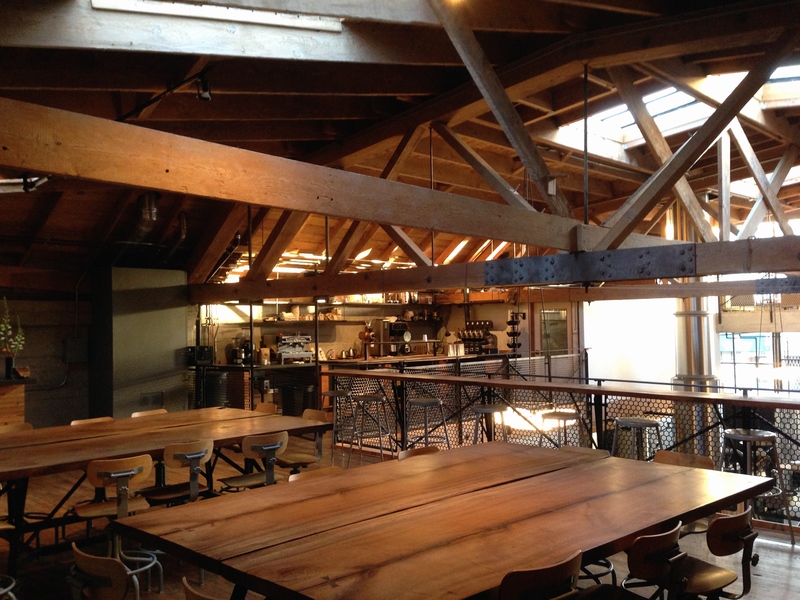 This breathtaking location serves as booth their roasting site and coffee shop. Two stories with beautiful wood work and an open airy feel. The upstairs view is fantastic and occasionally they host coffee teaching classes up there. 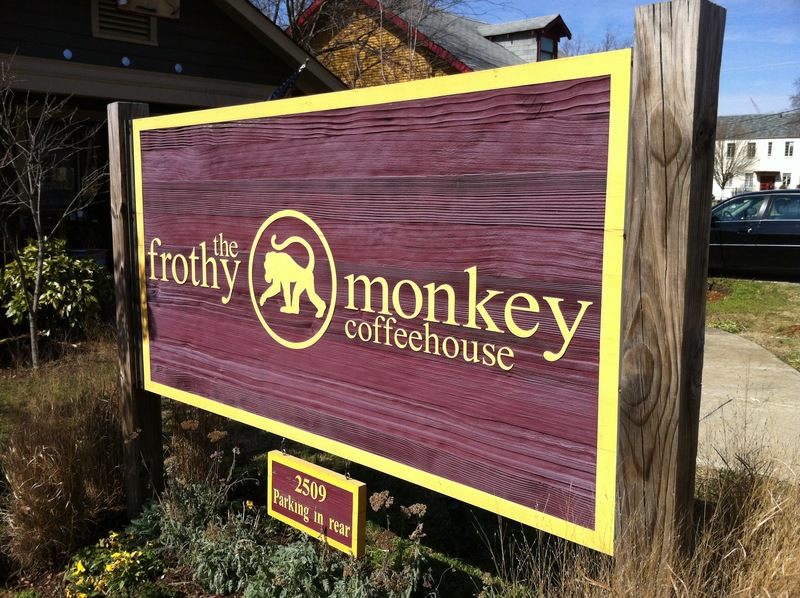 Their coffee is also exceptional – my Ethiopian pour over was one of my favorite coffees of the week. This is what Heaven would look like for a Coffee Geek Hipster. 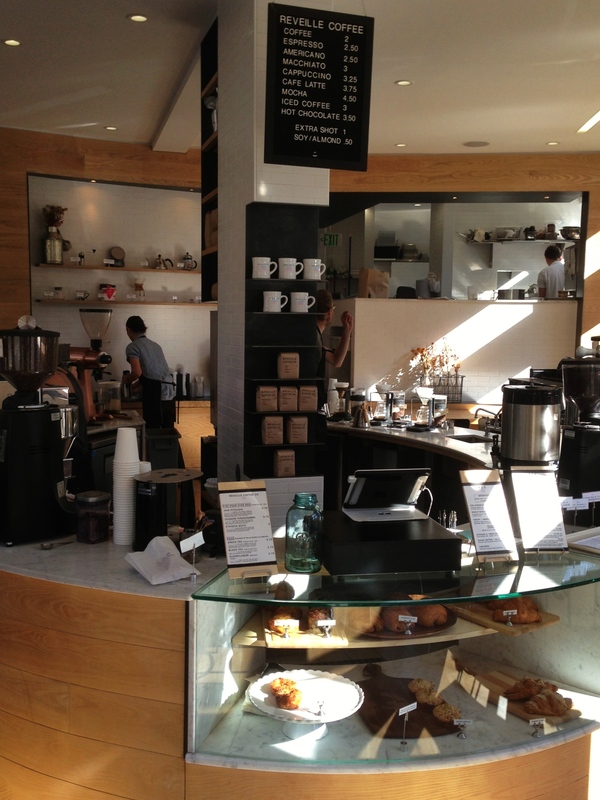 * Jane – exactly what you would want from a cafe while shopping on Fillmore in Pacific Heights. 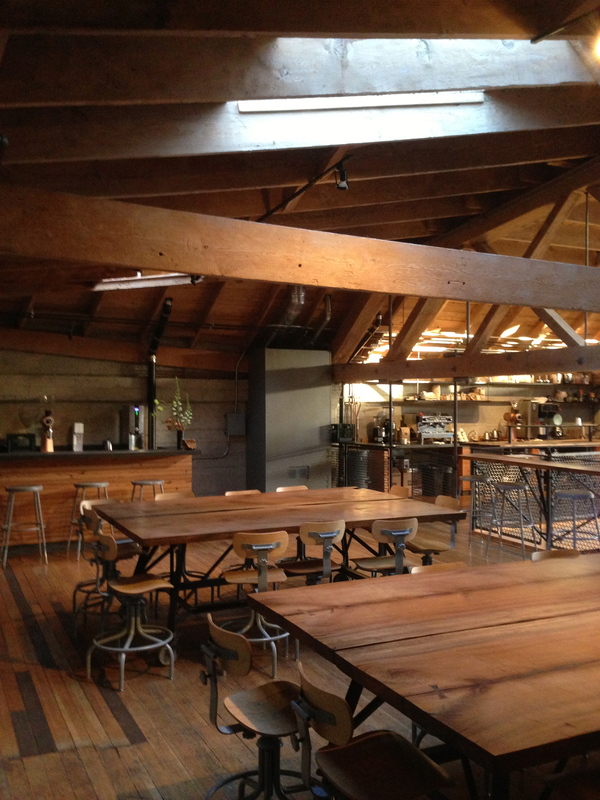 Great decor and tasty baked goods and the best part – they serve Stumptown Coffee. To us, it is what coffee should taste like. 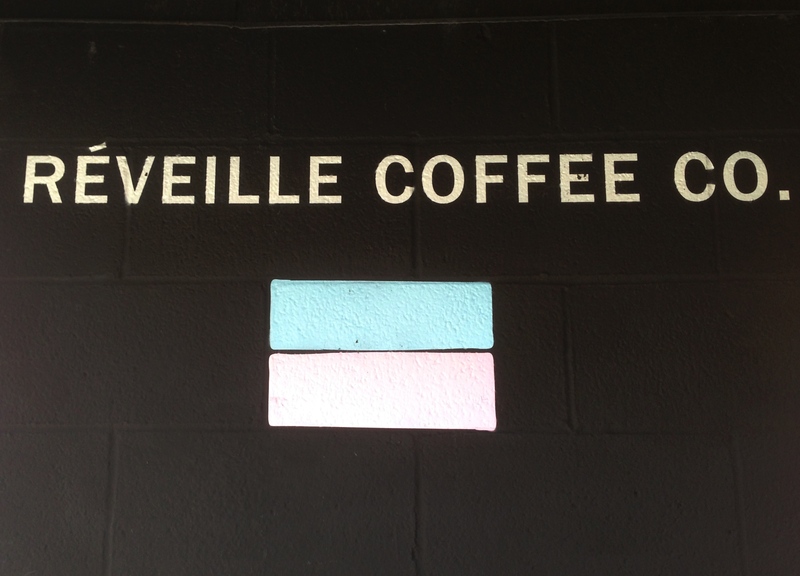 * Reveille Coffee Co. (Brick and Mortar) – great friendly corner coffee shop where Financial District meets Chinatown. Nice airy vibe and I loved the triangular corner lot. Friendly and engaging baristas. One of the best pour overs of the week. Nice selection of pastries as well as breakfast and lunch options. * Reveille Coffee Co. (Coffee Truck) – slick black truck that also serves a mean pour over. A mere 4 minute walk from their brick and mortar site. 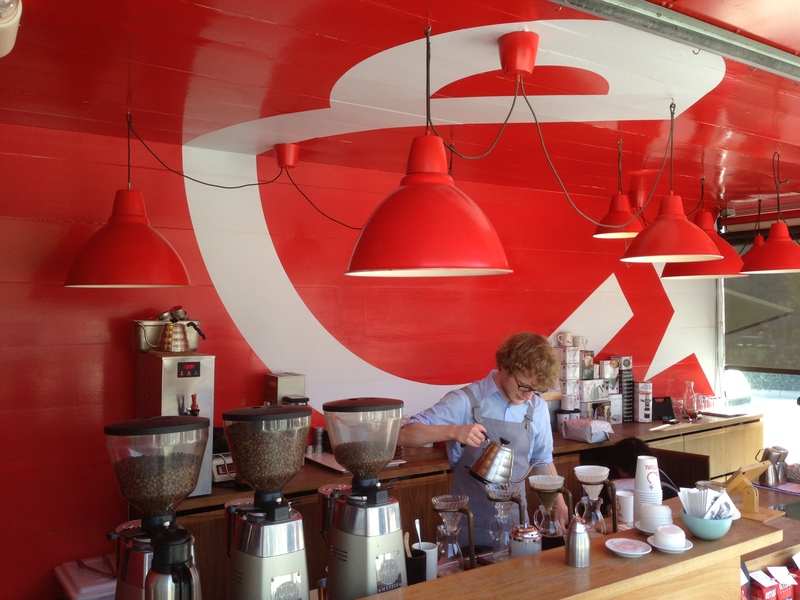 * Ritual Coffee (Brick and Mortar) – popular coffee shop and roaster in the Mission District. Love the flag/logo. High quality beans expertly prepared. 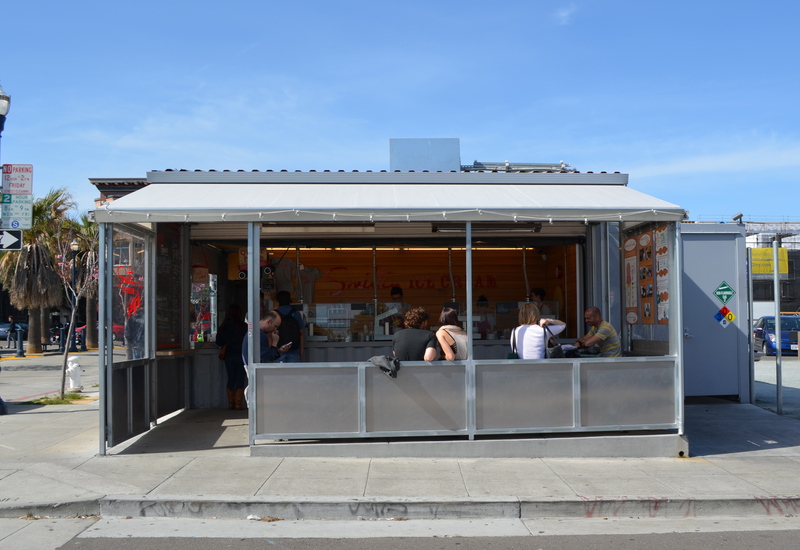 * Ritual Coffee (Coffee Stand) – open aired coffee shop on the back side of Smitten Ice Cream in Hayes Valley. Their roasts were perhaps a little lighter bodied than we usually prefer but still a good pour over nevertheless. The Hayes Valley area there has changed a lot in a few short years – now a nice small park with great options for coffee, ice cream (Smitten), and beer (unfortunately we were unable to go to Biergarten, next time). * Tartine Bakery – many times since we last went to San Francisco have we woken up in the morning and said, “I wish I had a Morning Bun from Tartine right now.” Truth be told, we have been craving delicious pastries and bread since our last visit out West. 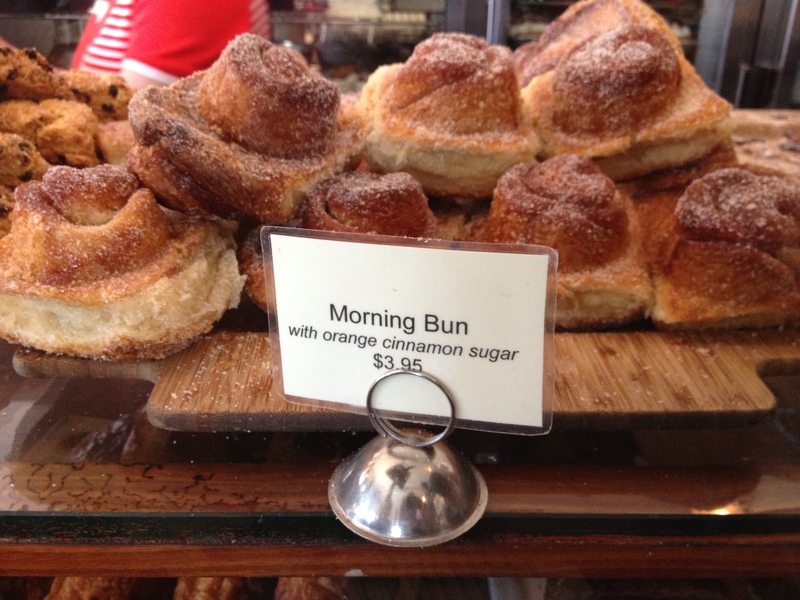 The Morning Bun(s) (we got several) were even better than we remembered, a truly memorable pastry – chewy and flaky with just the right hint of orange rind. The Almond Croissant and Plain Croissant are delicious and the Lemon Almond Pound Cake was flat out insanely good – so moist. Tartine Bakery may be our favorite bakery anywhere. * Humphry Slocombe – it would be a huge mistake to think that Bi Rite Creamery is the only legit ice cream shop in the Mission. 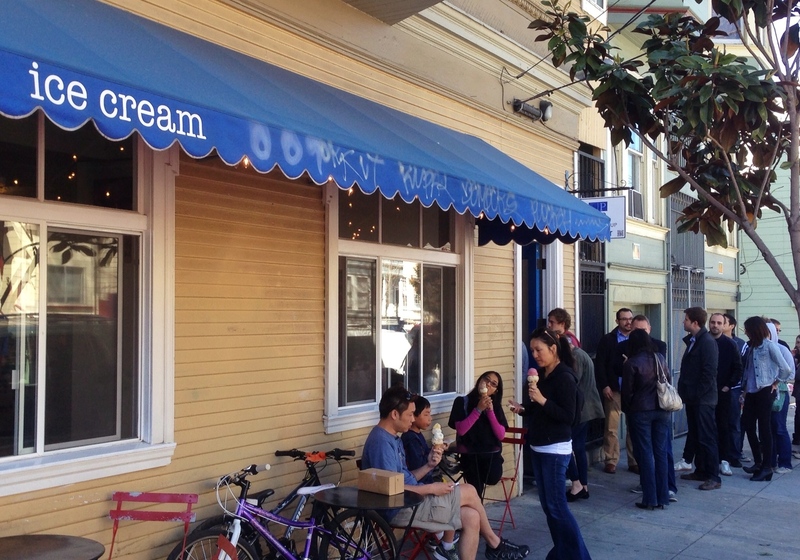 Humphry Slocombe brings world class ice cream with an unassuming charm. It would be easy to pass it by, if not for the winding line out the door. 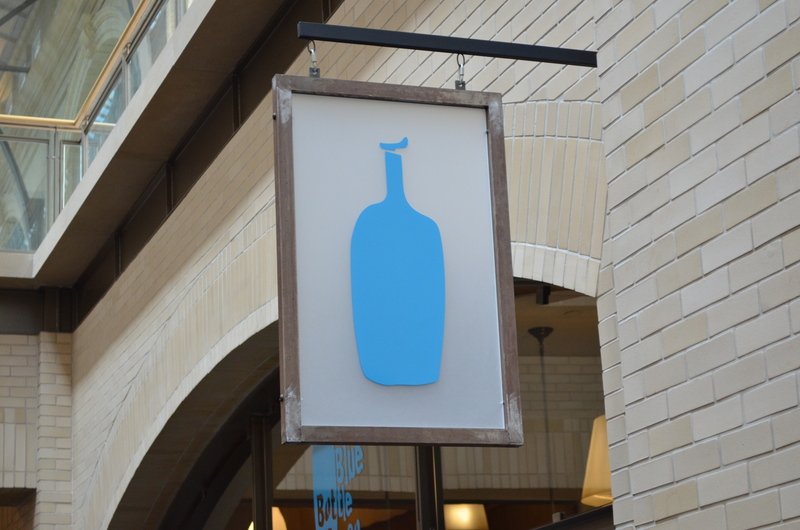 They rotate their flavors regularly but they are most known for two – Blue Bottle Vietnamese Coffee and Secret Breakfast, both of which are featured daily. The Coffee is easily our favorite ice cream ever – a perfect balance of sweetness of the cream and (I presume) condensed milk with the earthiness of the coffee left us wanting much more. The cheekily named Secret Breakfast features vanilla ice cream with Corn Flake Cookies laced with Bourbon. A guilty pleasure for sure. * B. Patisserie – very cute neighborhood pastry shop in Pacific Heights. The Kouign-Amann – their signature pastry, basically a flaky croissant with a gooey inside -fantastic. 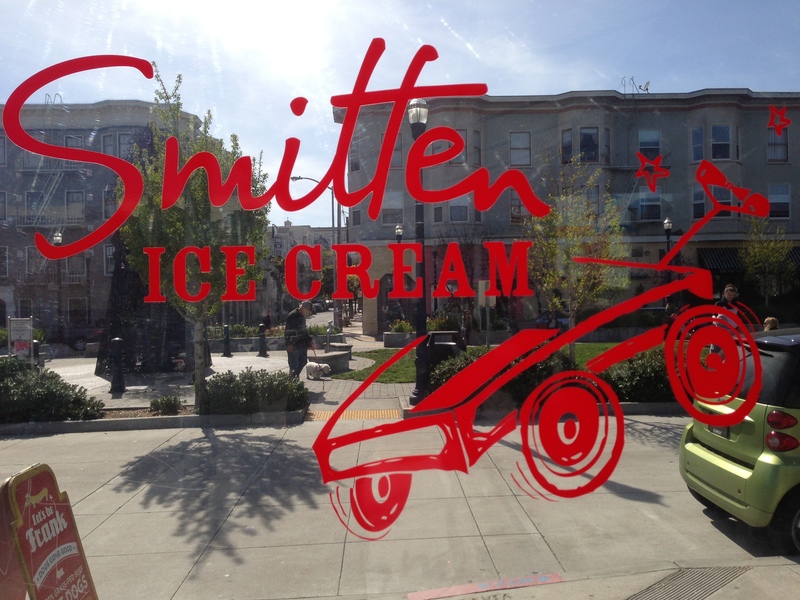 * Smitten Ice Cream – talk about a great idea! Ice cream made fresh to order! How? With machines that pump liquid nitrogen and freeze/mix/make the ice cream on the spot. It allows them to add fresh ingredients and create many different flavors without the ingredients getting soggy. We had their Rhubarb Crisp and at first the texture threw us off, but by the time we finished the cup we grew to love it. Not to mention the cute shop is in a beautiful part of Hayes Valley. A pleasant surprise for sure. Sorry Dippin’ Dots, Smitten is the “Ice Cream of the Future”. 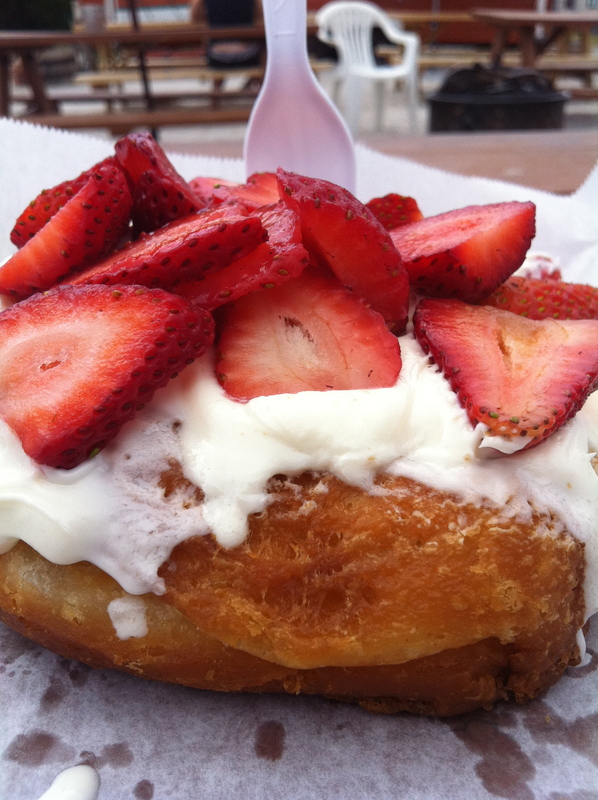 Happy Donuts – straightforward donut and pastry shop in the Financial District. Good, but not worth going out of your way for. Dynamo Donuts – whenever you read about top donut shops in the country, Dynamo Donuts seems to find its way onto the list. If you read our blog regularly, you know that we have been obsessed with donuts ever since our trip to Voodoo Doughnut in Portland, Oregon. After trying on multiple occasions to find a donut to live up to the Voodoo standard we have found only pretenders to the throne. The Dynamo donut is a little too cake-y and dense for us – not even close to Voodoo quality. So, as of now, sadly, we are officially shutting down our journey and declare Voodoo the best. 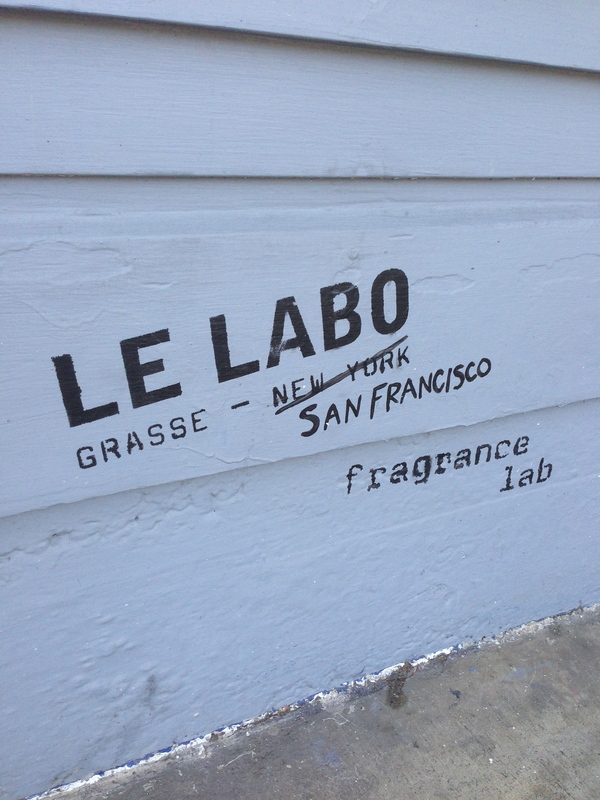 * Le Labo – we have been obsessed with Le Labo since our stay at Hotel St. Cecilia in Austin. We were thrilled to find out that this NYC fragrance company has opened a site on Fillmore. The service could not have been any more kind and welcoming. Their scent Santal 33 (with hints of cardamom, violet and sandalwood) is now my wife’s signature scent. One of the best parts of all – they actually make the perfume right there while you are waiting and create the label with your name on the bottle. * Nancy Boy – we fell in love with the signature scent of Nancy Boy in 2010 and it is now the official scent of our home. This fresh lavender scent is calming, soothing and just smells great. Stop in their Hayes Valley shop to smell their other scents and sample their artisan home, bath and body products or buy online. We’ve done both. Warby Parker Class Trip Bus – on my way to get a cup of coffee at the Reveille truck I turned the corner to find the Warby Parker Class Trip Bus sitting there. If you haven’t heard of Warby Parker yet, you will soon. 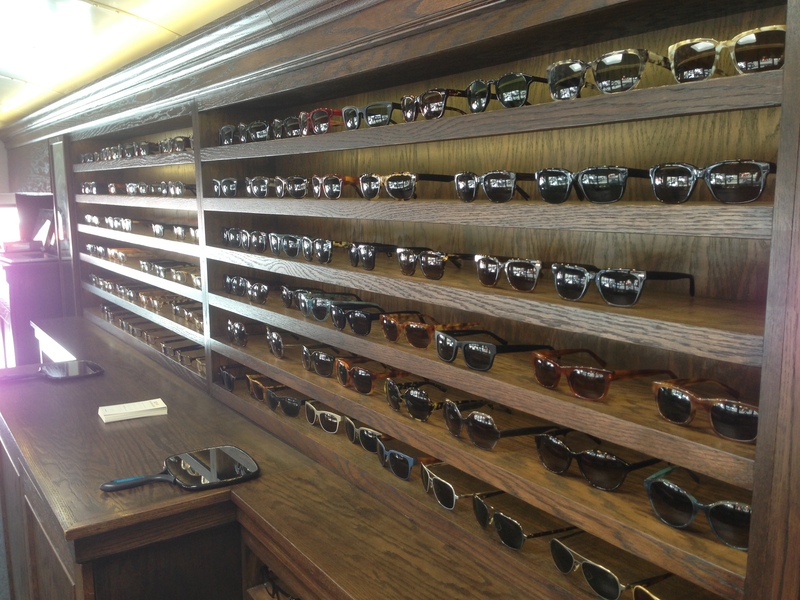 They are a new eyeware company that makes boutique frames but sells them at a remarkably low price point. Glasses and prescriptions for as low as $95. Not only that, for every pair sold, they give a pair to someone in need. 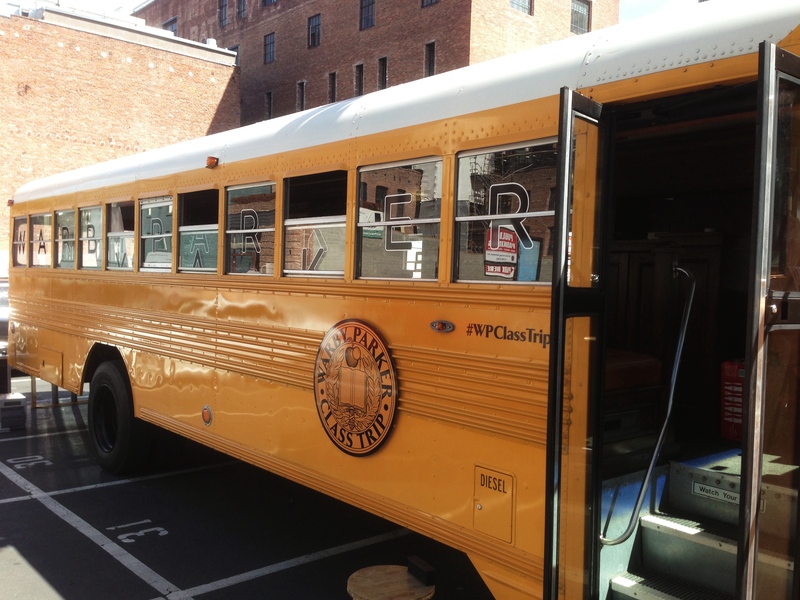 We were able to spend some time with Phineas and the great crew from Warby Parker when the bus was in Nashville several months ago. The bus has been on a journey around the country introducing their brand at a grass roots level. Low and behold, Phineas was still on the bus! Not only was it great to catch up with them, I also picked up a great pair of Aldous sunglasses. 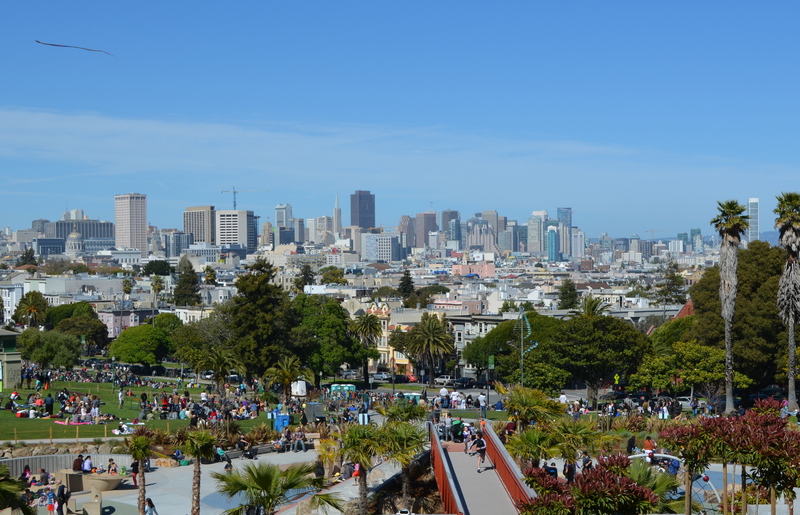 Sunday Streets San Francisco – We had no idea this event was even going on when we went to the Mission on Sunday but we could not have been more pleased. Every so often in the Spring and Summer the city shuts down a neighborhood on a Sunday and people just walk the streets and have FUN! 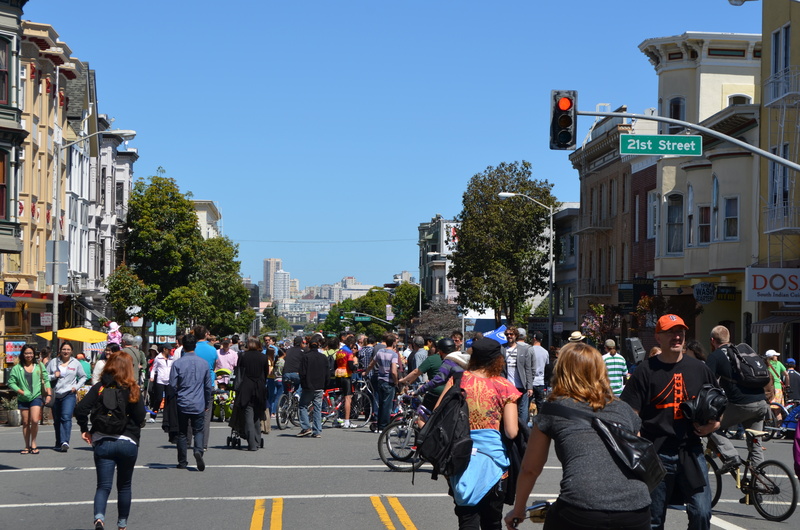 There were literally tens of thousands of people walking through the entire Mission area that day – some families with their kids on bikes, some marching playing drums, some dancing, some just taking a stroll in the neighborhood. Everyone just seemed so full of life and vibrant. It helped that it was 70 degrees and sunny the whole time. This is the kind of thing that makes so many people say that San Francisco is their favorite city. 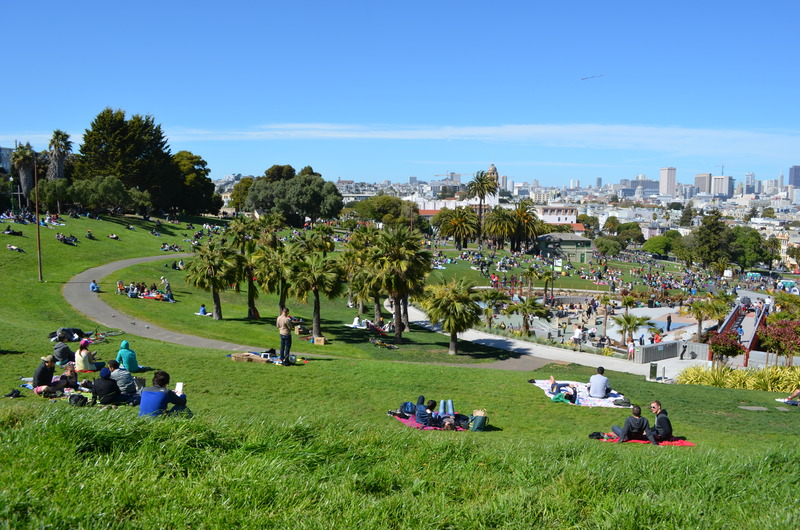 Dolores Park – absolutely gorgeous park in the Mission District that overlooks all of downtown. The grassy elevated perimeter is open to everyone and the whole area was full of blankets and people relaxing (and some smoking medicinal cigarettes). The interior is a fantastic playground area that is only open to kids and adults that are accompanying kids. I’m not sure who enjoyed it more, us or Oz. Fitness Court – National Fitness Campaign – okay, so how do we get one these in Nashville? This thing is great. 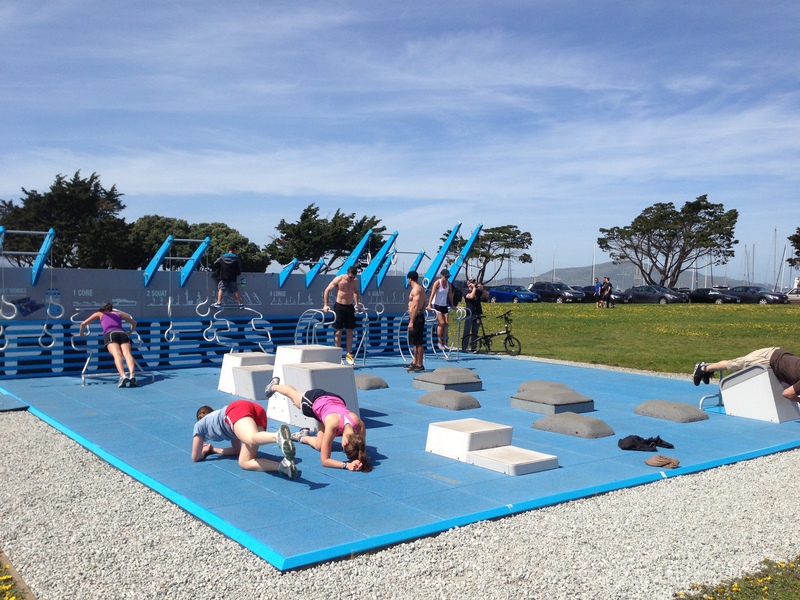 An open, free workout facility to the public right near the water in the Marina/Cow Hollow area. You can get a full body workout in this well designed court. 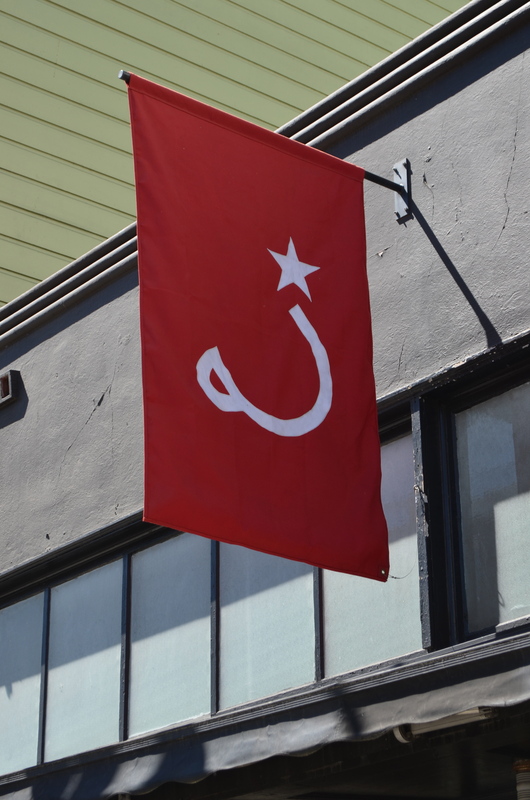 Sort of San Francisco’s sleek answer to the meat heads of Venice Beach. 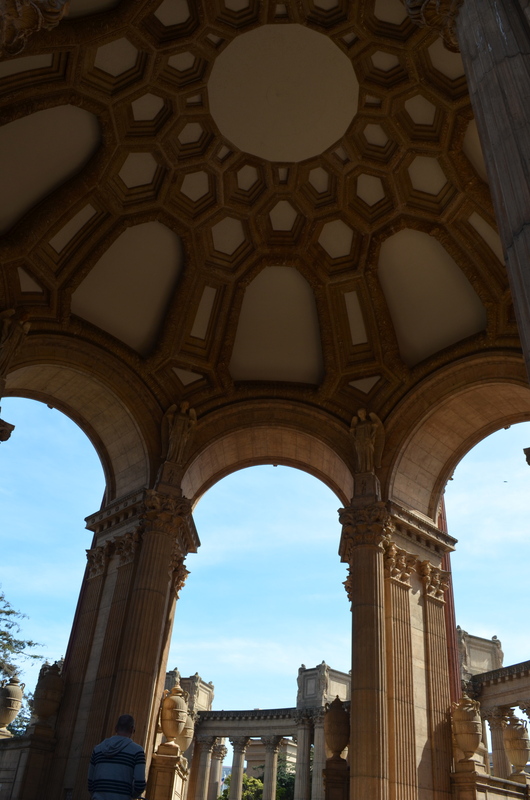 Palace of Fine Arts – we were breath taken by the beauty of the Palace of Fine Arts. Though we just strolled the grounds, you can see how the design and beauty would transport you back 2000 years to Ancient Greece or Rome. If the weather is nice, we’d consider a walk through this area high on our list of things to recommend. Not surprisingly, there were about 10 people getting wedding photos the same time we were there. 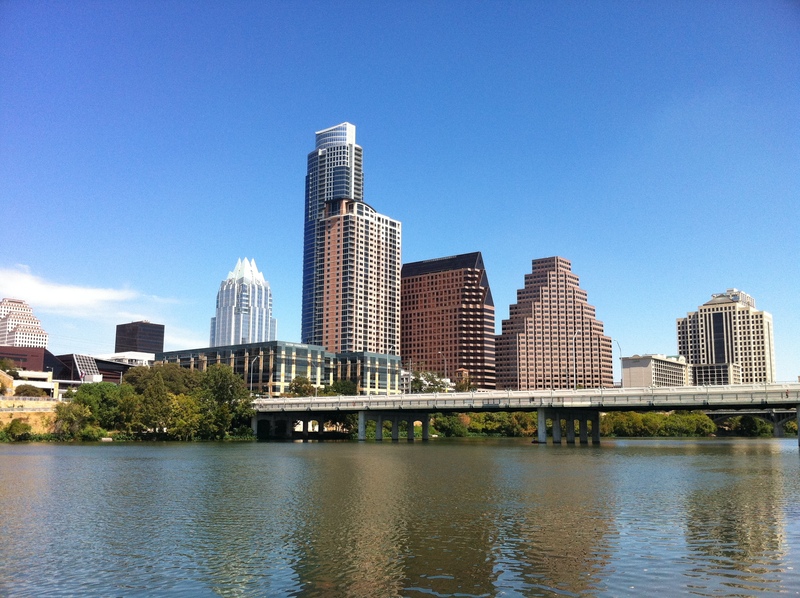 We are heading back to Austin soon and wanted to give you a preview of our trip. Although we will miss the madness that is SXSW (intentionally) we thought that our agenda may be of help to anyone heading down to ATX this week. We will be in town for 4 nights – that ends up being 4 breakfasts, 4 lunches and 4 dinners plus a bunch of grazing in between. We won’t be able to make it to all of these places, but we are hoping we can hit most of them. 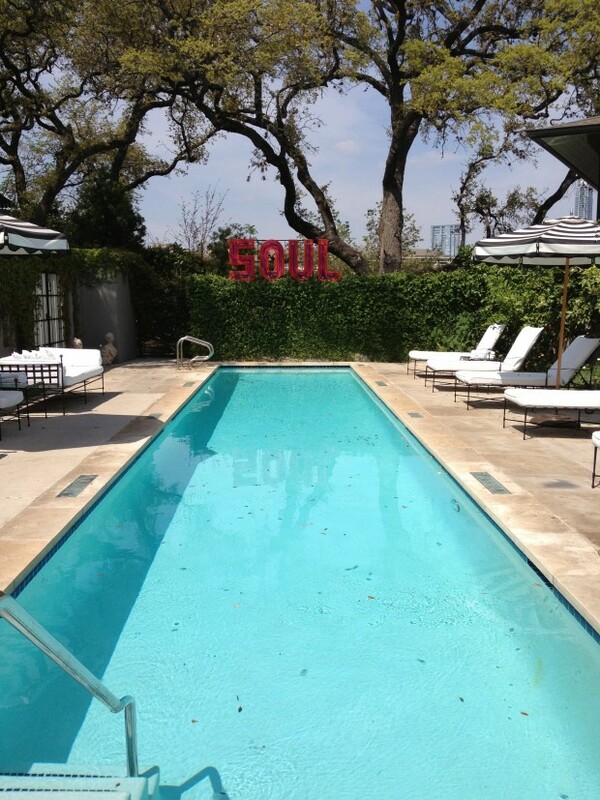 *Hotel Saint Cecilia – we decided last visit that we’d stay here on our return to Austin and we are glad that we followed through. Absolutely gorgeous. 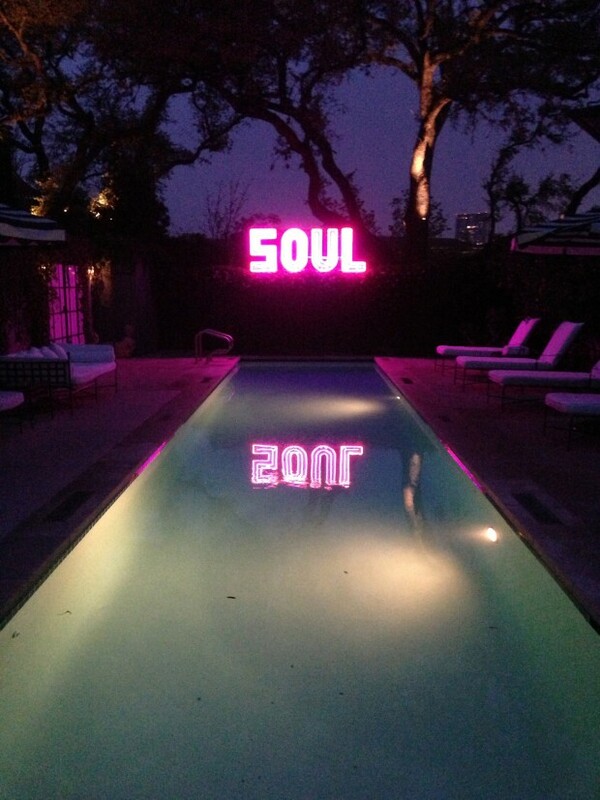 Right now, as the clouds are gray and dreary outside, not much sounds better than having a drink while sitting poolside at Hotel Saint Cecilia. Coffee is on our agenda this trip and we plan to check out a few new coffee shops, as well as return to some of our old favorites. 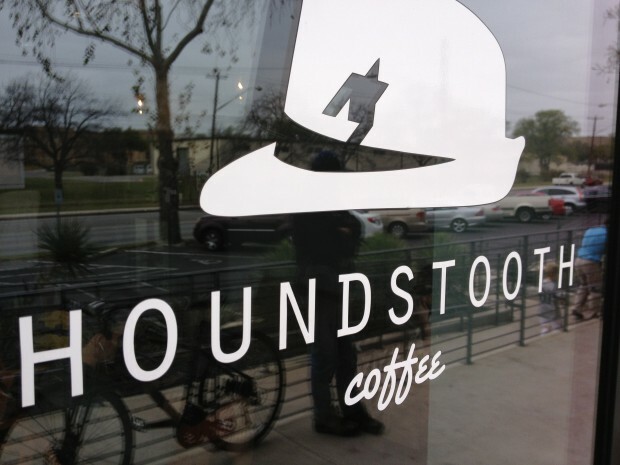 *Houndstooth Coffee – the original shop is on North Lamar in the same strip as Uchiko but they have just opened up a new downtown shop in the Frost Bank Tower. They use beans from multiple roasters including Counter Culture and brew using several techniques. 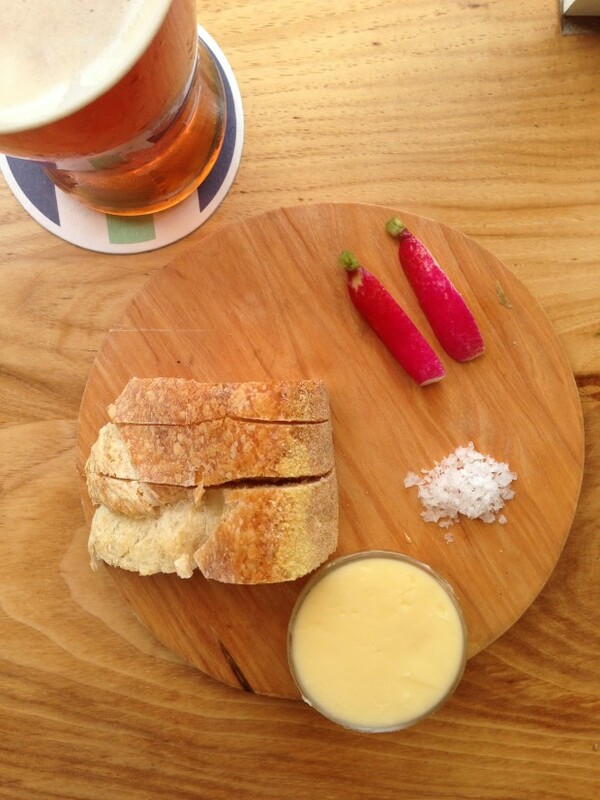 They also serve pastries from Bakerman Bakery and have beer on tap. Jo’s – no trip to Austin is complete without a stop at Jo’s for an Iced Turbo. 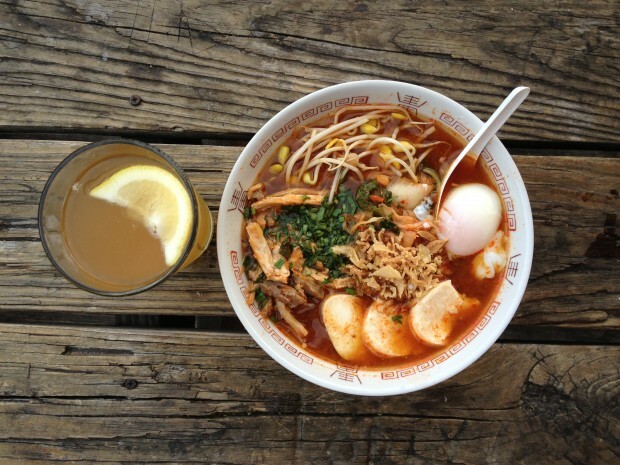 We love both the South Congress walk up outdoor cafe as well as the 2nd Avenue shop with full menu and indoor/outdoor seating. 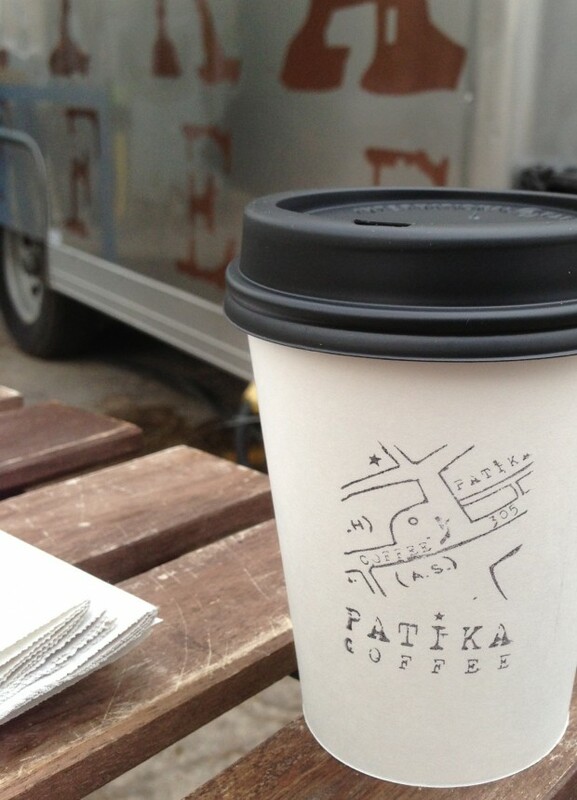 Patika Coffee – we loved this downtown coffee truck from our last visit and plan to hit them up after a run on Town Lake Trail for a latte and some of the delicious looking pastries from Flour Bakery. *Frank – great coffee at a hot dog joint? It sounds weird to us too, but everything we’ve read sounds as if they take their coffee program seriously. Their beans are from up and coming Handsome Coffee Roasters in Los Angeles a La Marzocco GB5 for their espressos and Hario V60 for their pour overs. Caffe Medici – we tried the Clarksville location last time but they have a newer location in the Austonian downtown that we’d love to try. Elizabeth Street Cafe – we loved the decor and the pastries last visit but were not blown away by their vermicelli or their banh mi. 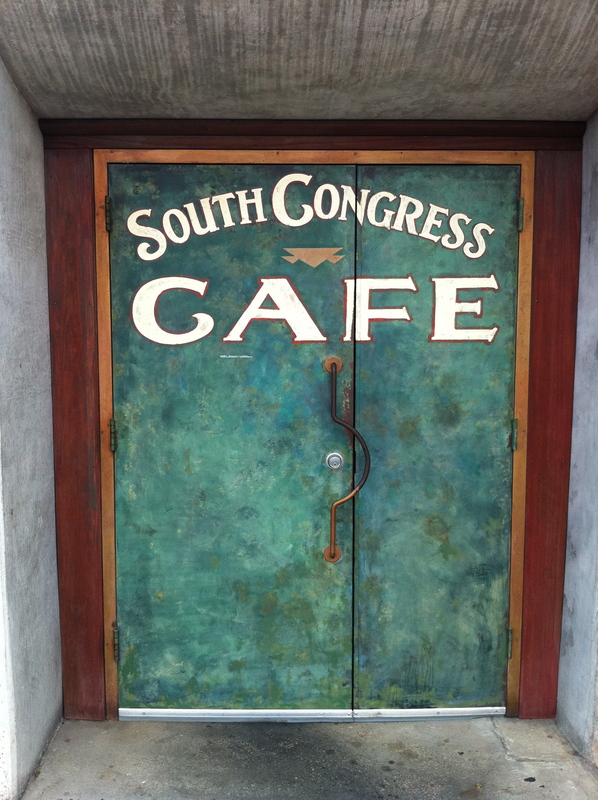 We want to give it another try and plan to head there for breakfast with some good friends. We also love that they brew Stumptown Coffee. 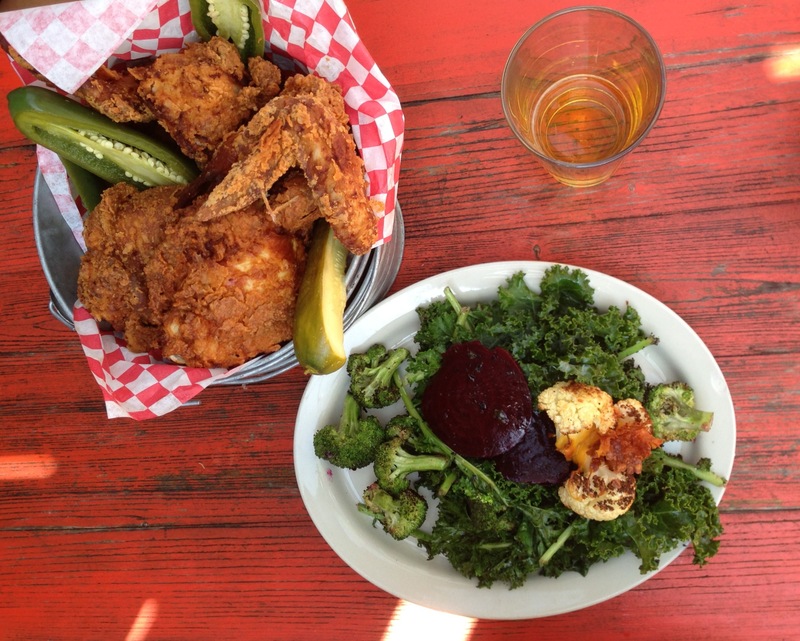 Lucy’s Fried Chicken – why is it so hard to find good fried chicken?? 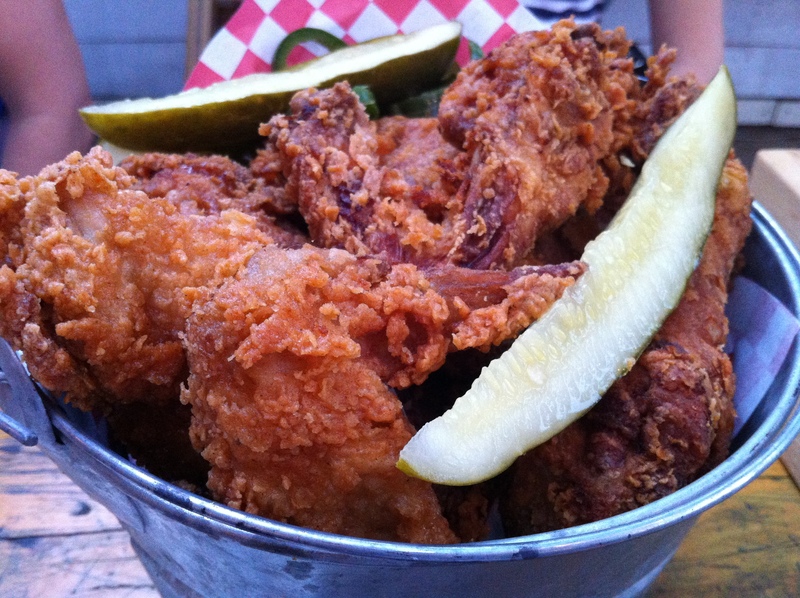 Since we last had Lucy’s, other fried chicken has left us disappointed. 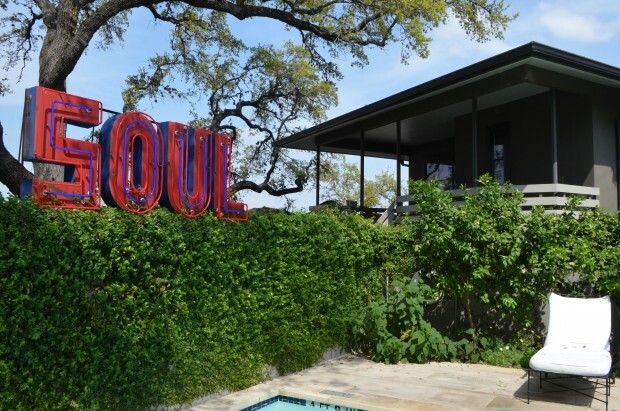 We plan to gather the in-laws and head here for a family feast – one of the best places in Austin to bring the whole gang. We can see Lucy’s becoming an Austin tradition for us. 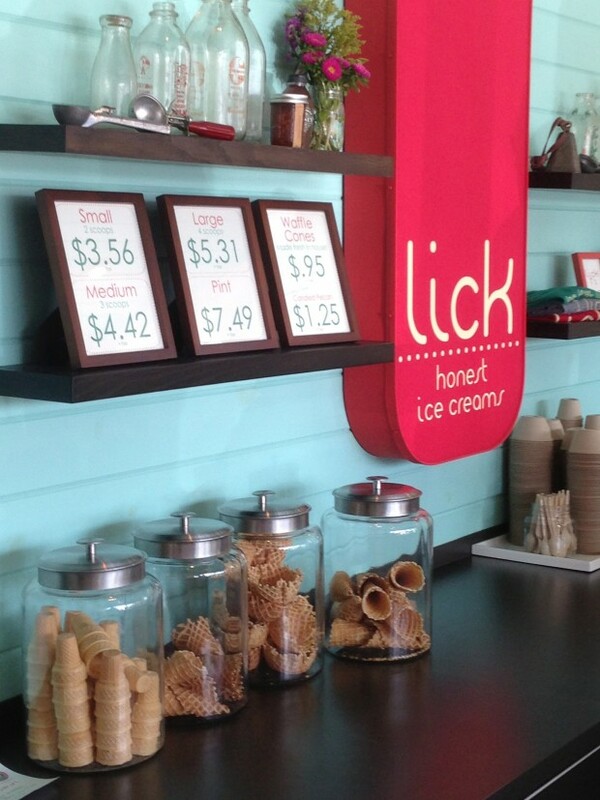 *Lick Ice Cream – we likely won’t leave Lucy’s without having some of their delicious pies but we will still find room to try out this creative ice cream shop on South Lamar. The hard part will be deciding which flavor to get – Lemon Poppy Seed or Dark Chocolate with Olive Oil and Sea Salt or Strawberries and Cream?? Franklin Barbecue – we didn’t go last visit and have regretted it ever since. Aaron Franklin’s brisket is in a league of it’s own and we find it impossible to believe anyone anywhere is making it better. 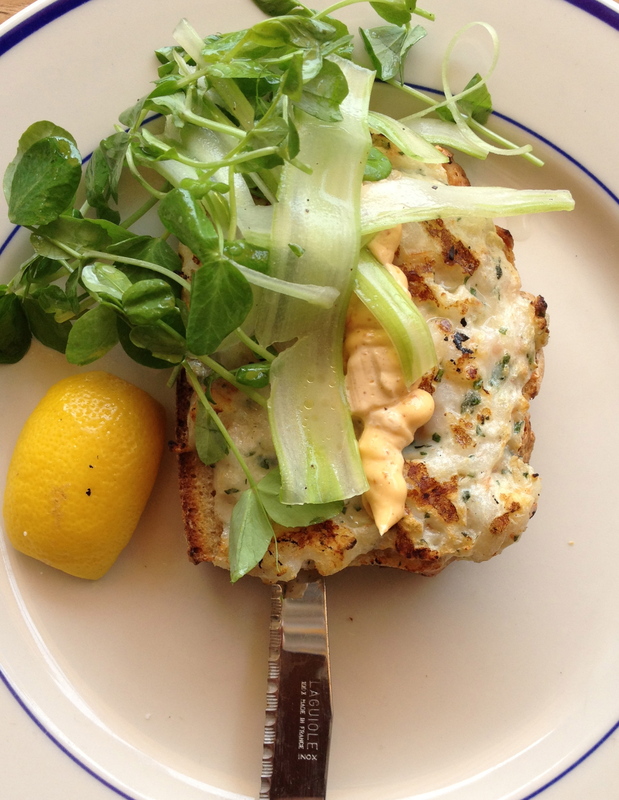 *Clark’s Oyster Bar – this is one of the new places that we are most excited about trying. 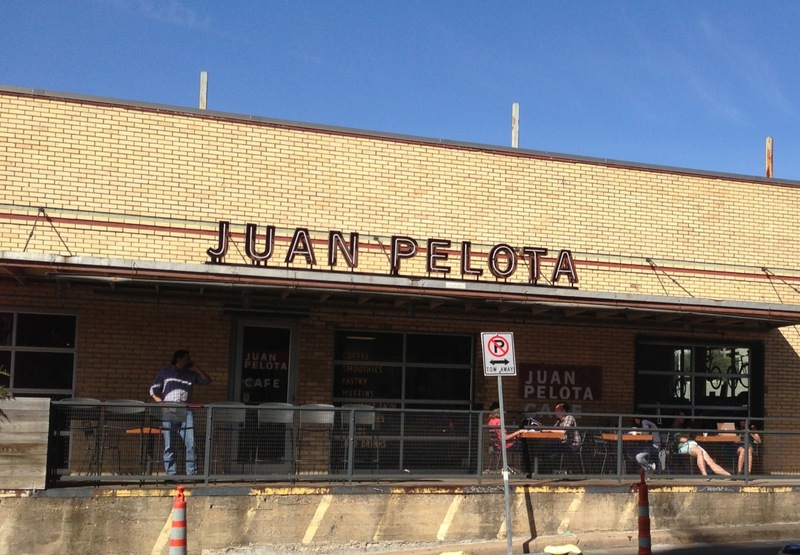 This little brother to Perla’s has taken over the former Portabla site in Clarkesville and the photos of it look beautiful. 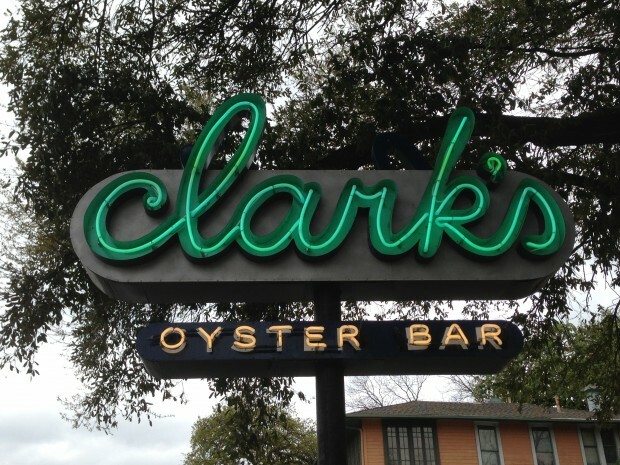 We love fresh oysters and Clark’s has a nice selection along with very tasty sounding seafood options. *Sway – this upscale thai restaurant from Chef/Owner Rene Ortiz (La Condesa) was on our ‘Must List’ since we read about it’s opening. Open for lunch and dinner we thought we’d opt for lunch, sit on their patio and try some upscale Thai cuisine. Everything on their menu sounds delicious. Uchiko – although Paul Qui is no longer in the kitchen (he’s opening his new namesake restaurant, Qui, in the next few weeks) we have heard that the kitchen is still at the top of it’s game. 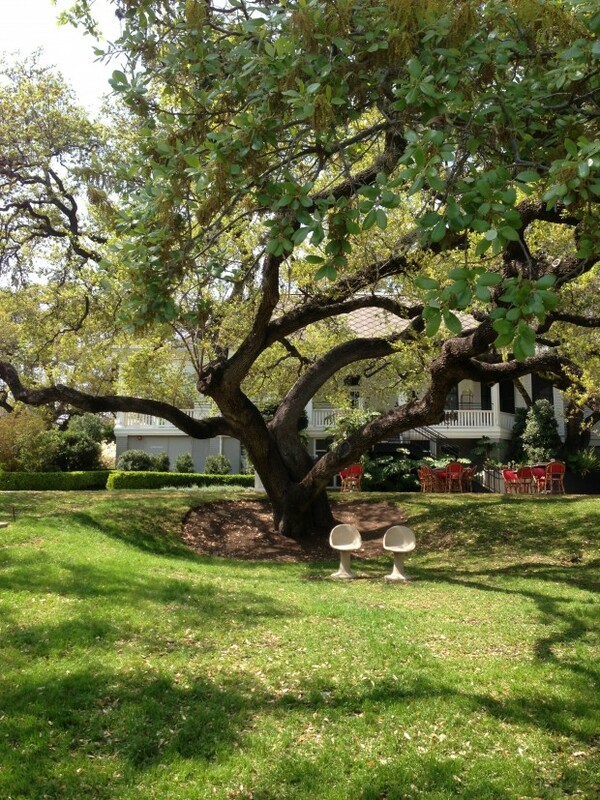 Always tough to decide between here and Uchi – arguably the two best upscale restaurants in town. The Ham & Eggs roll with pork belly and yolk custard is a must. 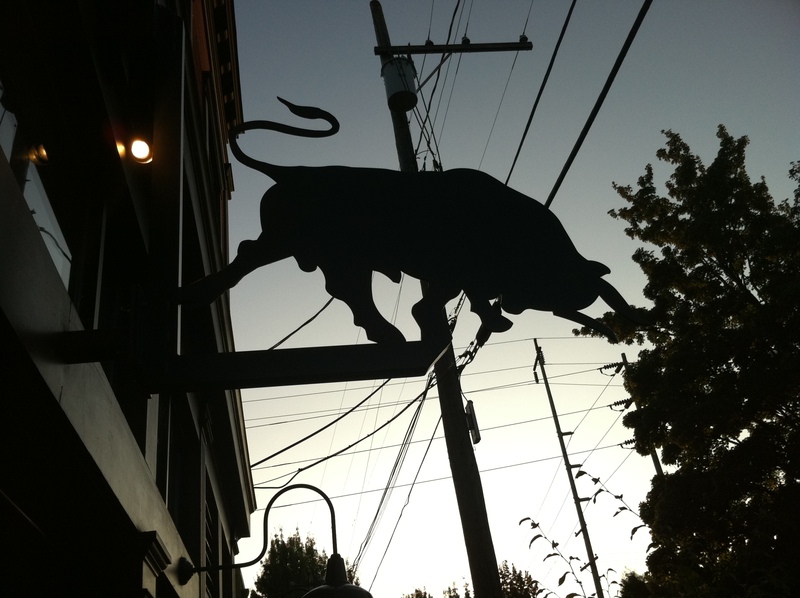 *Barley Swine – We have always wanted to try Chef Bryce Gilmore’s critically acclaimed creative small plate gastropub. We had been deterred by the reported long lines. They now offer some reservations Mon-Thurs and we jumped on it. 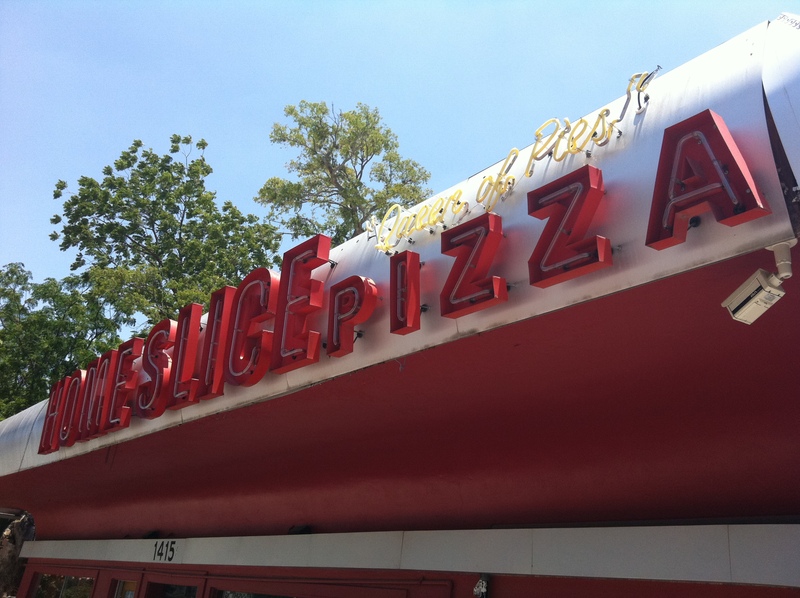 Home Slice Pizza – What can we say? We love us some Home Slice. 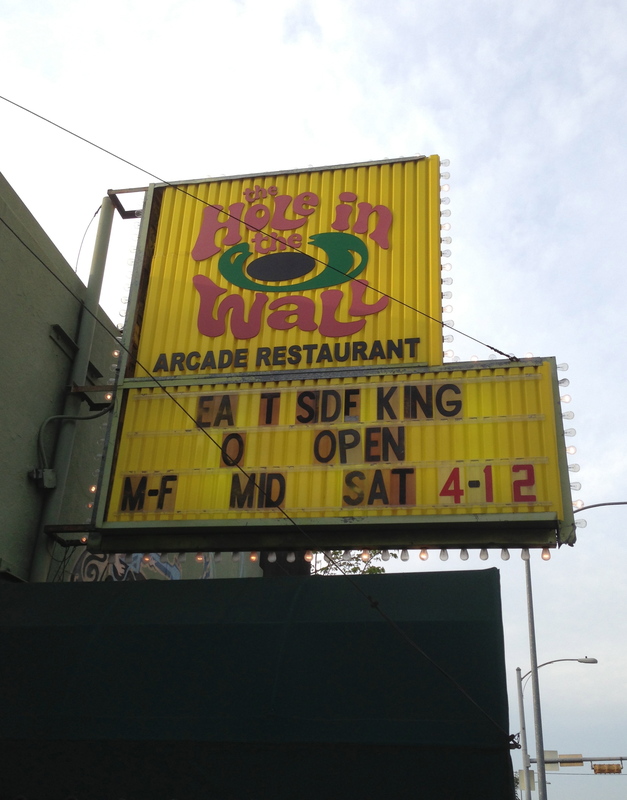 *East Side King @ Hole in the Wall – amazingly we have never tried any Paul Qui’s East Side King food trucks. He has recently opened up a brick and mortar site in this bar on the Drag near the UT Campus featuring some of his greatest hits from his trucks. We checked to be sure we could bring our 9 month old (they said “Absolutely”). 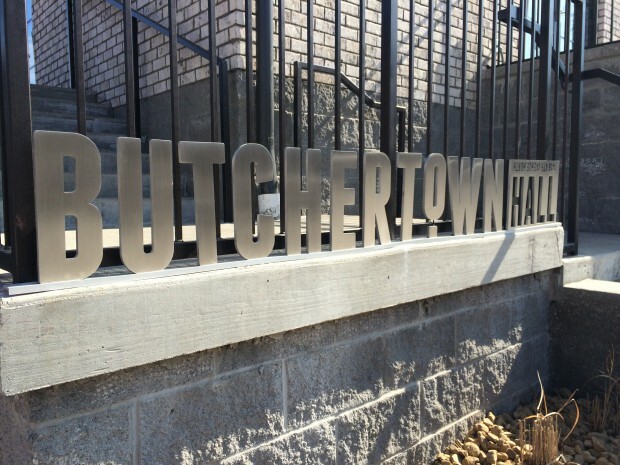 *Salt & Time – new butcher shop and salumeria in East Austin selling meats and sandwiches. Opened up the first official Cuvee Coffee shop inside as well. *Chameleon Cold Brew – cold filtered highly caffeinated bottled coffee. 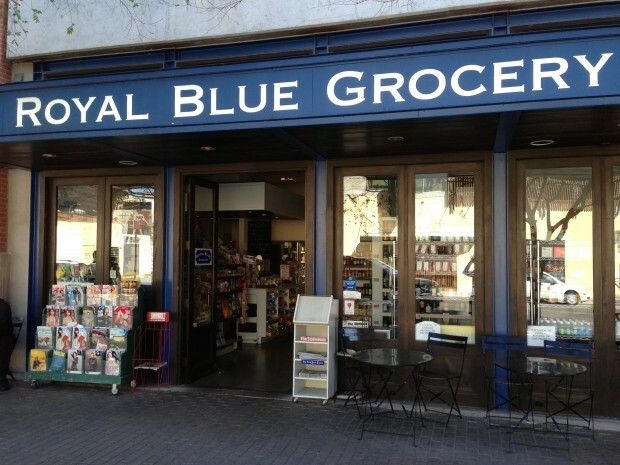 Available in the uber-cool Royal Blue Grocery (please open up a grocery in Nashville) and Whole Foods. *East Side Showroom – cocktail bar in East Austin. Has been on our list for some time. Doc’s – if it’s nice outside we are for sure going to be watching some March Madness having a drink here. 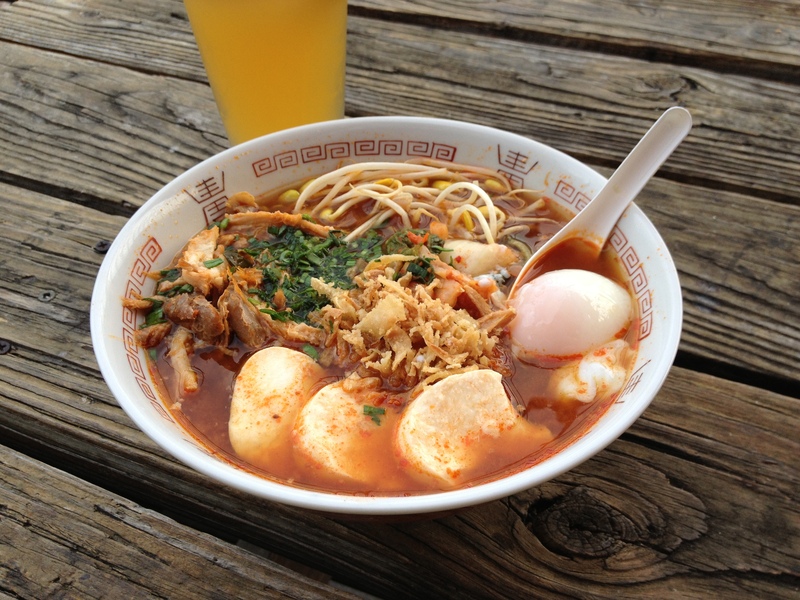 Rainey Street Bars – I am itching to check out this happening area downtown featuring multiple bars and food trucks. Quality: A key factor regarding the quality of something is whether or not it would stand up to competition if it were in a different city. Just because something is the “best” in (Your City Here), does not necessarily mean that it is actually high quality. 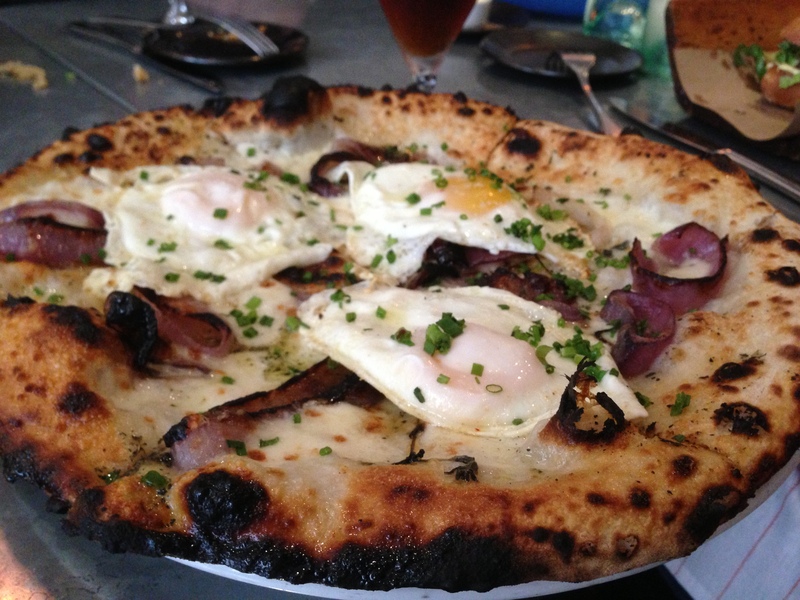 For example, Antico Pizza is not just “great pizza for Atlanta”, it would be considered great pizza if it were in any city – including NYC and Chicago. We not only consider the absolute quality of the product but also whether or not it consistently delivers the same quality on repeat visits. Experience: This is a combination of several factors including the service that you receive as well as the atmosphere. For example, a beautiful sit-down restaurant with excellent service is virtually always a higher quality experience than a food truck where you are eating out of a paper plate while standing in a parking lot. This factor is sometimes under-appreciated by places but it is nearly as important as the quality. A great tasting meal is ruined by a rude waiter and makes it highly unlikely that you will return there again. Additionally, we love aesthetics and design (do not read “fancy” or “expensive”) and that factor in and of itself heightens our overall impression. Basically, did you have an enjoyable time while you were there and was it something that you will remember? Cost: This is pretty self-explanatory, the more expensive it is, the higher our expectations. We also don’t want to pay brick-and-mortar prices for food trucks and we don’t want to pay restaurant prices for pop-up dinners and supper clubs. We made a quick trip this past weekend to see friends in Atlanta and we were able to try a few new places that we wanted to tell you about. The food scene in Atlanta is expanding at a rapid rate and there are many more places that have still yet to visit. These are the ones that made the cut (and are also included on our Atlanta City Page). 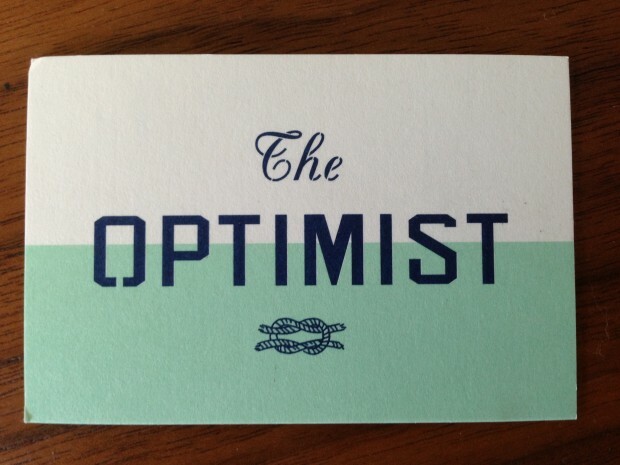 The Optimist – fantastic upscale seafood restaurant and oyster bar from Chef/Owner Ford Fry with Executive Chef Adam Evans manning the helm. The decor is a beautiful and creates an atmosphere that feels like a fish market-meets-warehouse-meets Grand Central station. The main dining room is large and bustling and features more fish entrees. 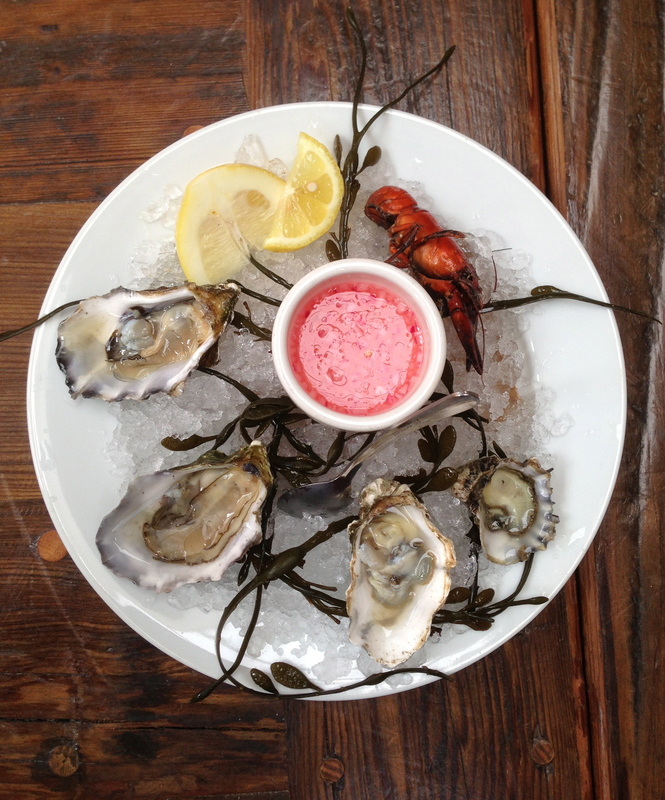 They also have an attached Oyster Bar with more oyster options with a scaled down menu. We loved the Florida grouper with smoked vidalia onion and horseradish broth as well as the Duckfat poached swordfish with pickled sweet peppers and crispy pancetta. The fish and chips featured a tasty but astonishingly large beer battered Haddock with shoestring chips. Wash it down with one of their signature cocktails or an Allagash White on tap. The honey ice cream was a great way to end the evening. 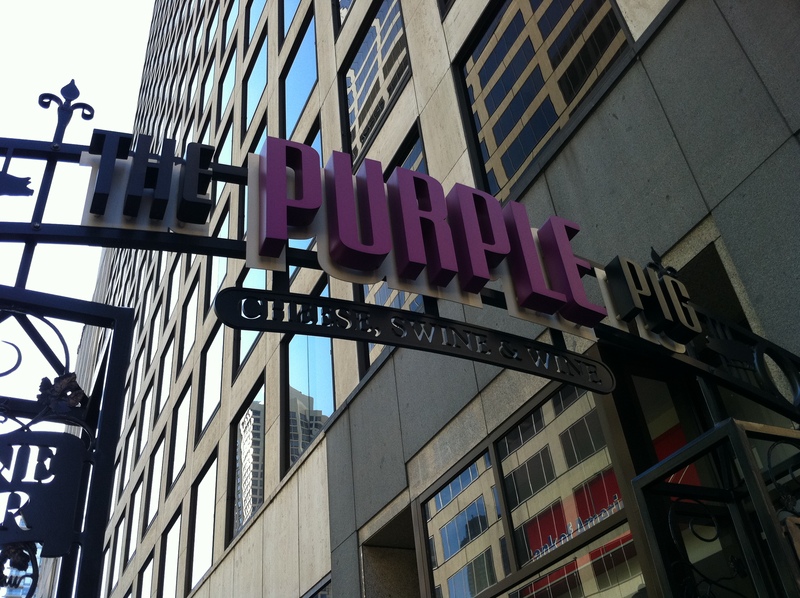 This restaurant is receiving well deserved accolades. If you are going for dinner plan to get a reservation in advance. 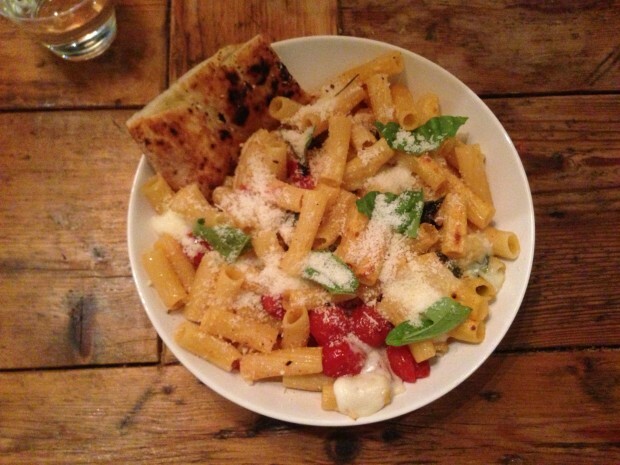 Gio’s Chicken Amalfitano – Chicken and pastas from the owner’s of Antico Pizza (and right next door). The roasted lemon chicken is tender and flavorful and the skin is crisp and savory (i.e. – nice and salty). 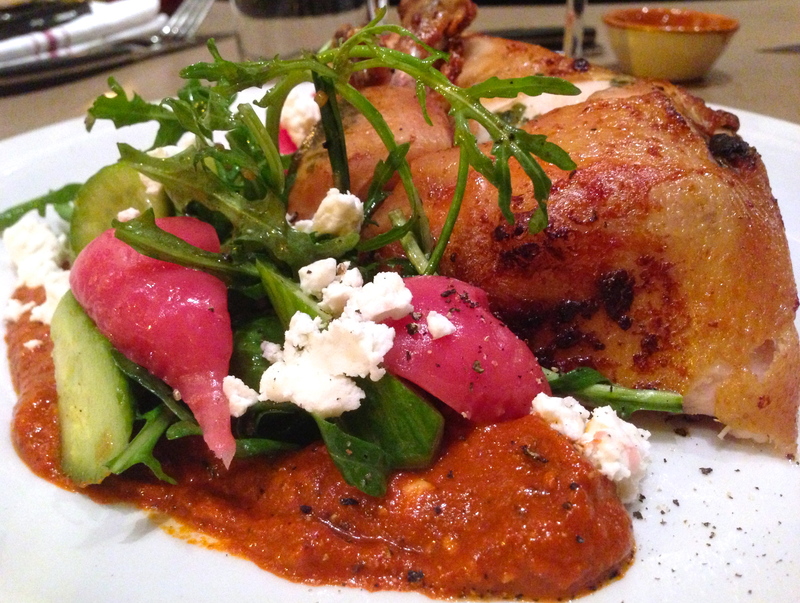 We loved the Diavola chicken with Calabrian peppers, garlic, fresh crushed pepper and olio picante. 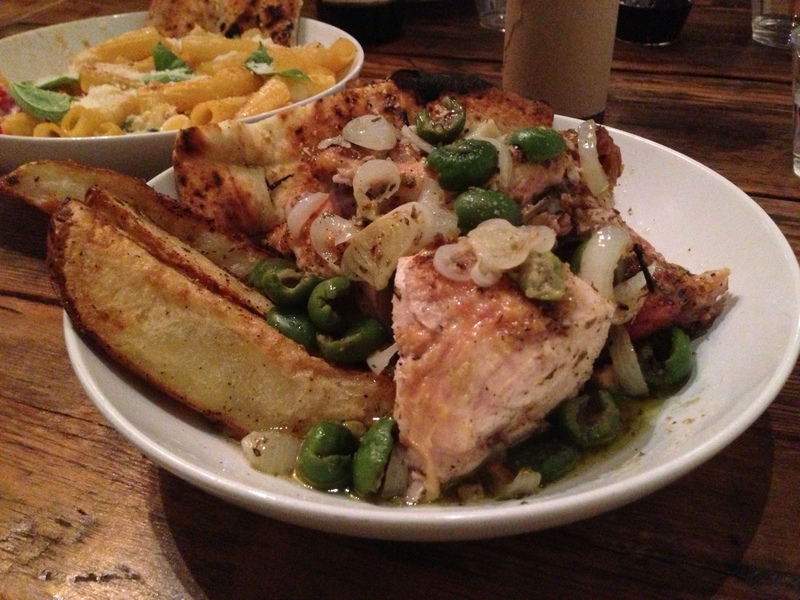 The portions are generous and great for sharing several plates. Available for take out or dine in. No. 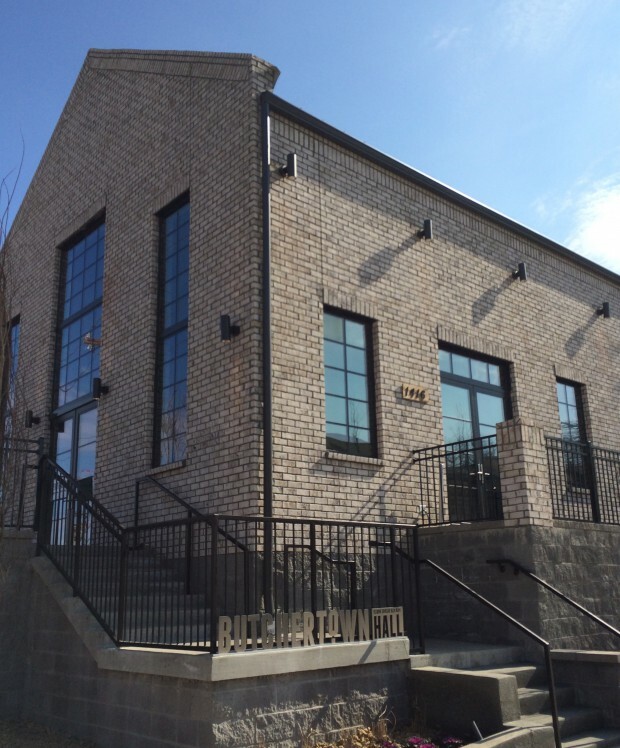 246 – rustic Italian from Chef/Owner Ford Fry in Decatur featuring handmade pastas and wood fire grill utilizing local and seasonal ingredients. 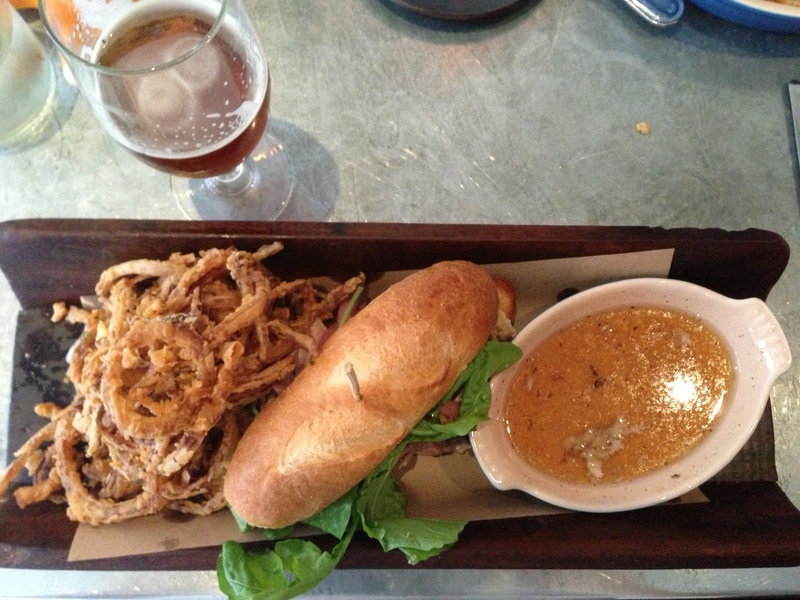 The Porchetta sandwich is delicious and comes with its own roasting jus for dipping. The spaghetti with Georgia shrimp and crisped bread crumbs was a standout as was the Paper Pilot cocktail (12 yr Elijah Craig with chili-infused Aperol and lemon). Open for lunch and dinner. Have you been to The Adjective Animal yet? If you haven’t, let me tell you all about it. The first thing that you will notice is that it doesn’t take itself too seriously. You can tell immediately when you walk through the doors that it wants to be approachable, fun and whimsical. Certainly, “unfussy” would be one word to describe it. The decor may be minimal but it still feels comfortable and modern. The ambiance is vibrant and patrons are encouraged to enjoy each others company, making for a great eclectic mix of people in the place. The wait staff may be dressed casually but they are still attentive and helpful. 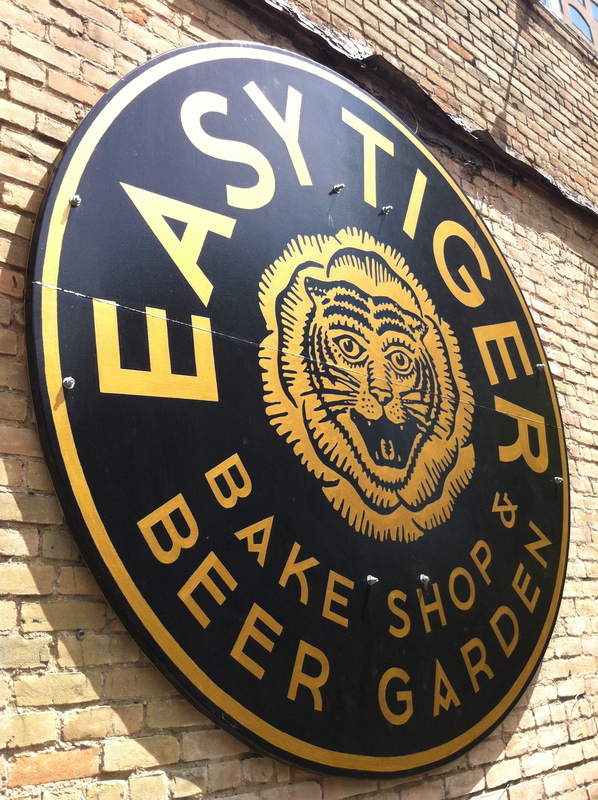 Make no mistake, though, the food and drink here is intended to please even the toughest foodies out there. 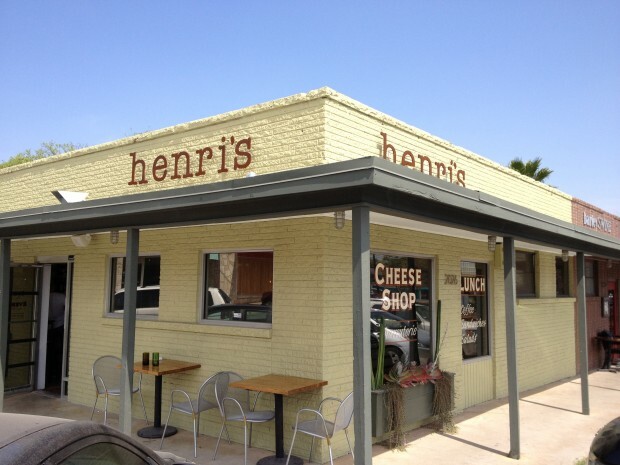 So, next time you are in town don’t forget to stop in and give it a try! Well, if you haven’t heard of The Adjective Animal that is because it doesn’t exist – we just made it up. We’ve noticed that almost every week a new restaurant or bar opens somewhere named with an adjective followed by the name of an animal. 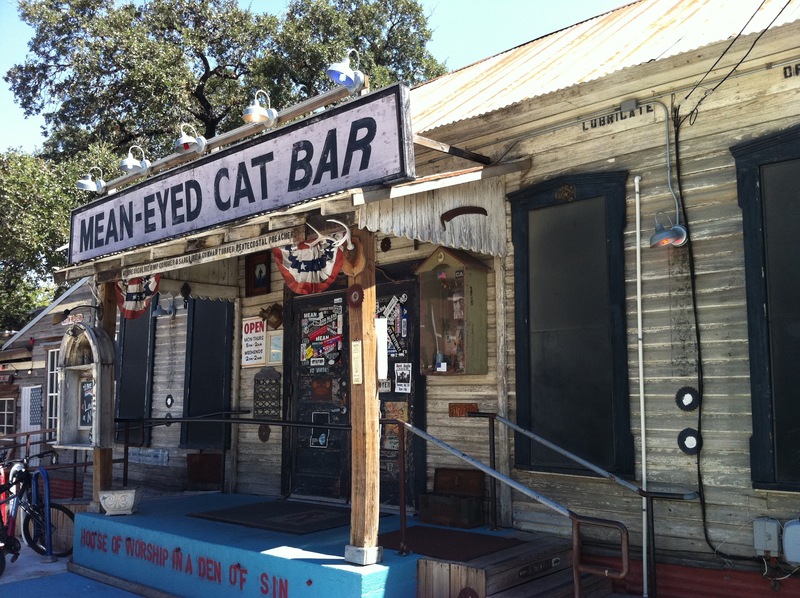 Here’s a list of some of these “Adjective Animal” restaurants – we’re sure we missed dozens more, so let us know and we’ll add them to the list!